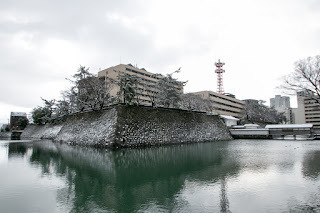 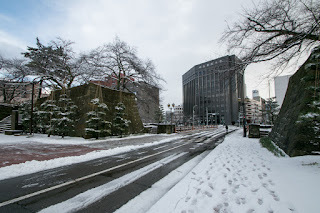 Fukui Castle (福井城) is located in the central area of Fukui city. 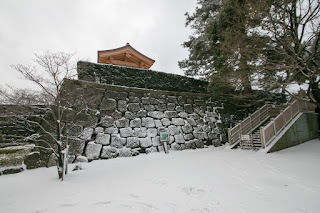 Echizen country (Fukui prefecture) was originally governed at Fuchu area, 20km south of current Fukui city in medieval area, or Ichijyodani valley at 10 kilometer east of current Fukui city during the period of Asakura clan, but they were narrow area and had no room for expansion. 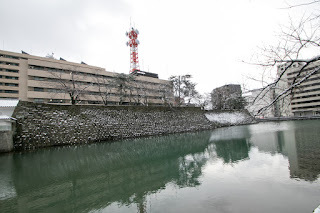 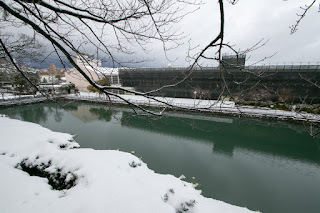 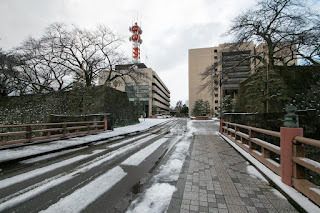 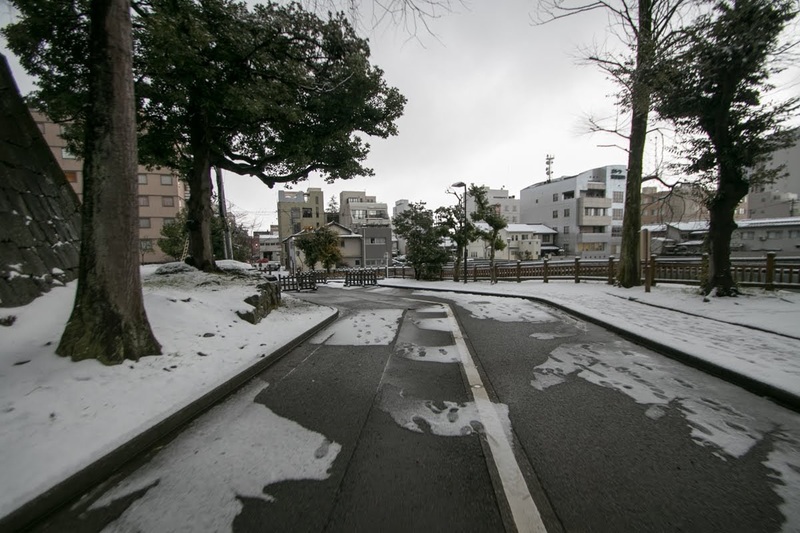 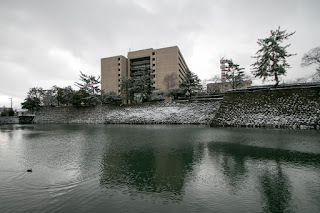 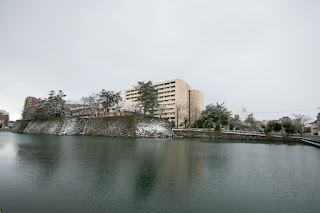 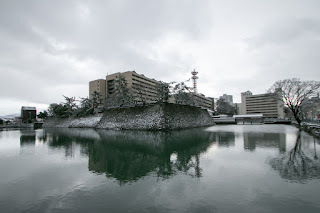 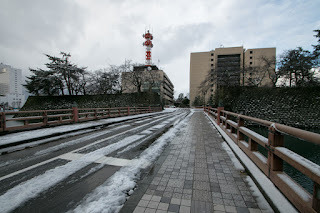 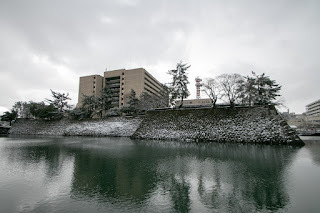 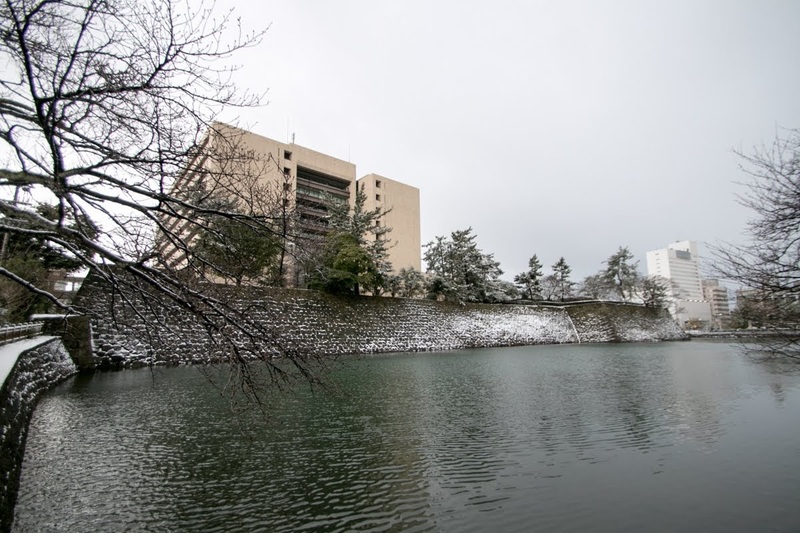 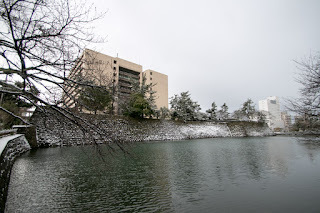 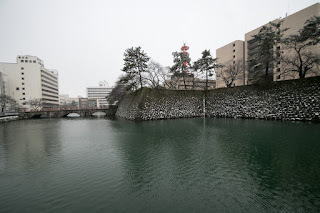 On the other hand, current Fukui area was a large plain and faced Hokurikudo way, the main road connected Kyoto and Hokuriku region, but surrounded by large rivers such as Ashimorigawa river and Kuzuryugawa river, suffered from severe flood. 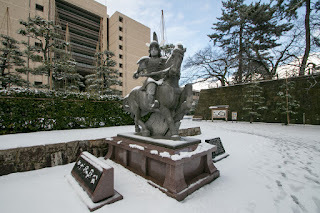 In 1576, after the extinction of Ikko Ikki rising by central ruler Nobunaga Oda (1534-1582), his general Katsuie Shibata (1522-1583) was appointed as a regional commander of Hokuriku region. 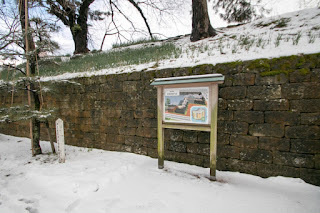 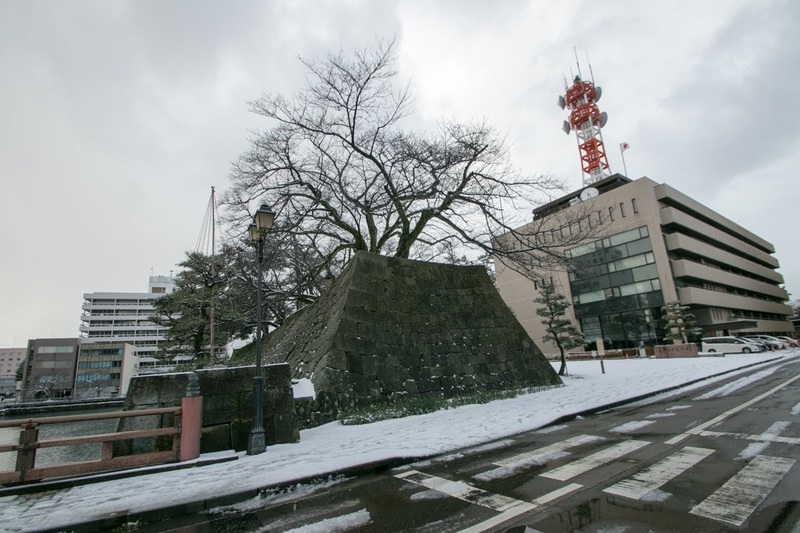 Katsuie built Kitanosho castle at the place of current Fukui castle, but the central area of Kitanosho castle existed at current place of Shibata shrine, former merging point of Ashimorigawa river and Yoshinogawa river. 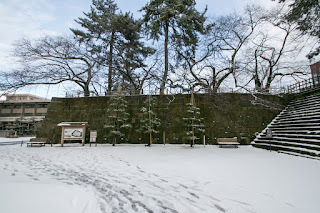 After the defeat of Katsuie by Hideyoshi Toyotomi (1537-1598), Aoki clan became the commander of Kitanosho castle, but Aoki clan was also expelled after the battle of Sekigahara in 1600. 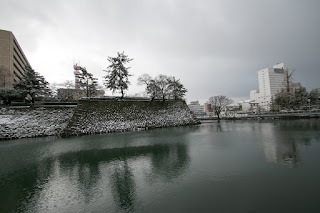 After the battle of Sekigahara, new ruler Ieyasu Tokugawa (1543-1616) placed Hideyasu Yuki (1574-1607), his second son, as a governor of Fukui castle with large territory. 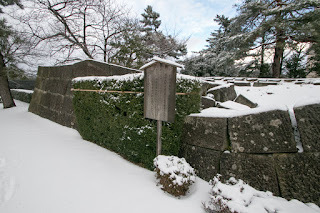 As Nobuyasu Tokugawa (1559-1579), eldest son of Ieyasu and once became the successor, were forced to suicide for the suspect of betrayal in 1579, as second son Hidetada could be the successor of Ieyasu. 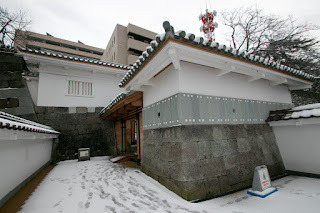 But Hideyasu's mother was a lady maid and did not have status, Ieyasu chose Hidetada Tokugawa (1579-1632), the younger brother of Hideyasu and whose mother was a daughter of powerful lord of Mikawa country, as his successor. 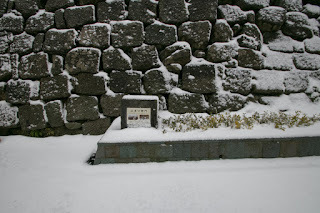 After the death of Nobunaga, Ieyasu fought against Hideyoshi who aimed the position of next ruler in cooperation with Nobukatsu Oda (1558-1630). 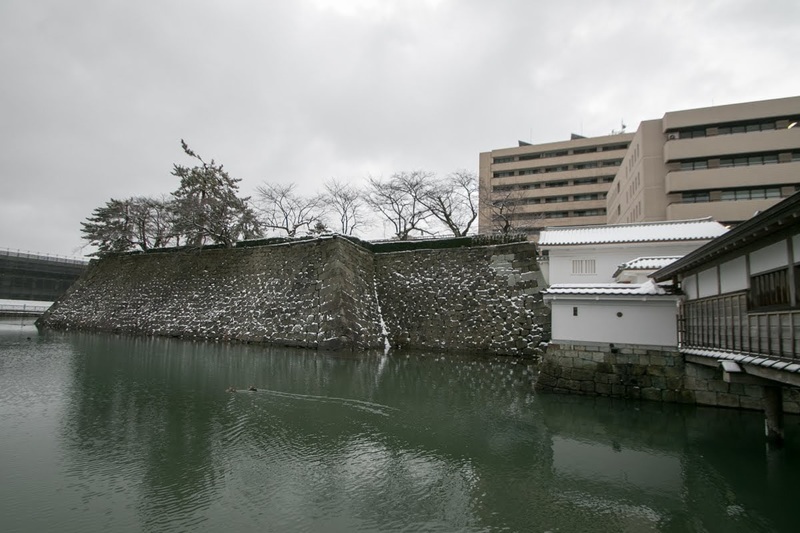 Ieyasu fought well and defeated Toyotomi army at the battle of Komaki Nagakute in 1584, but due to the difference of territory and economic power overall generation was inferior to Ieyasu. In this year Hideyoshi and Ieyasu once ceased fire, and Ieyasu sent Hideyasu to Hideyoshi as a sign of friendship, but virtually as a hostage. 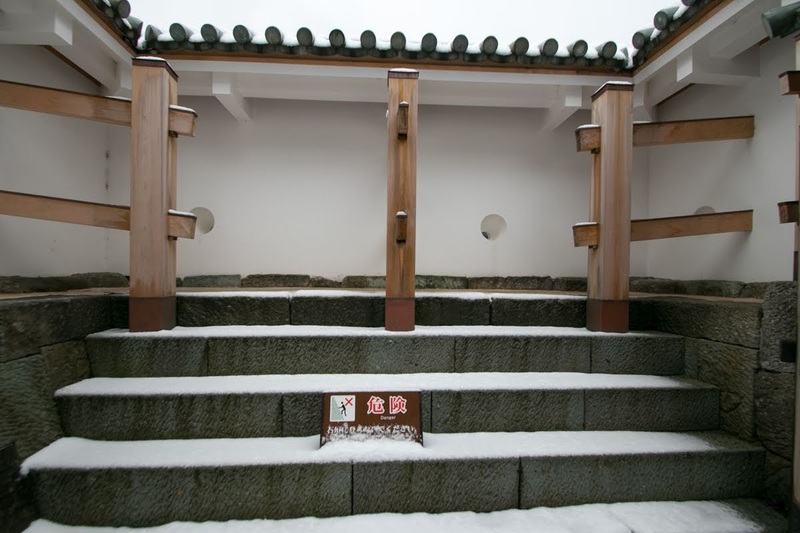 Hideyoshi treated Hideyasu as his virtual son, but later sent Hideyasu to Yuki clan, a small but traditional clan of Kanto region as a successor in 1590. 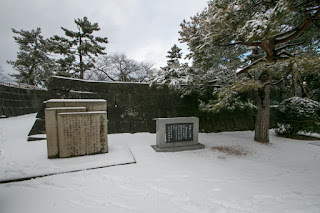 Hidetada became only the successor of small clan, but he was a brave general and popular among other generals. 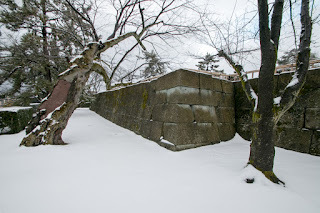 After the death of Hideyoshi, a conflict arouse between Ieyasu who aimed next hegemony and Mitsunari Ishida (1560-1600), a chief administrative staff of Toyotomi government and who hoped to keep the Toyotomi government. In 1600, Ieyasu once made an expedition to Kagekatsu Uesugi (1556-1623), who was close to Mitsunari and held Aizu area (Fukushima prefecture). 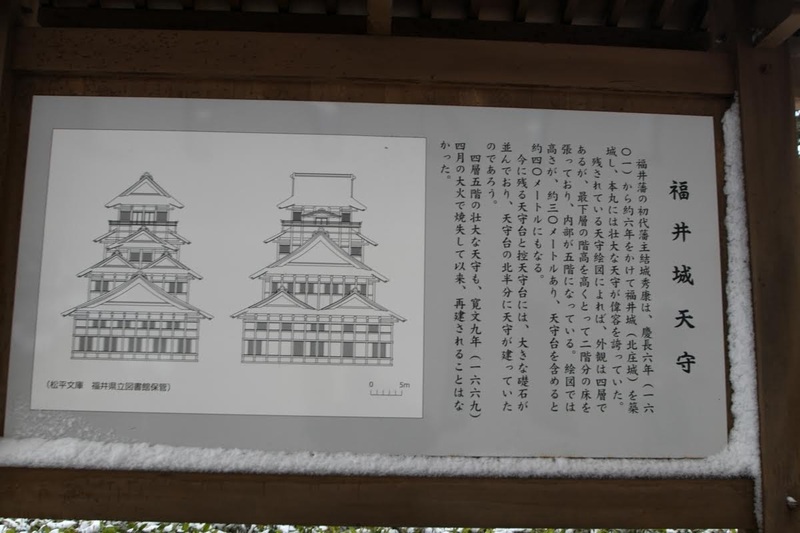 But utilizing the absence of Ieyasu, Mitsunari raised his army with other large lords such as Mouri clan or Ukita clan. 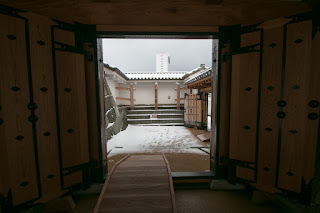 Ieyasu decided to make U-turn to have a decisive battle against Mitsunari, but Uesugi clan still thriving and a rear guard was necessary to hold Uesugi clan. 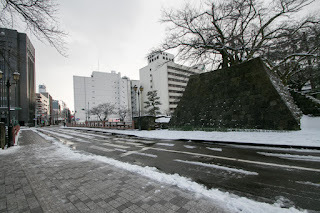 Ieyasu assigned this important role to Hideyasu, and Hideyasu gathered lords of Kanto region and allowed Kagekatsu no chanse to attack Tokugawa army from backside (in fact, once knowing Ieyasu did not come to Aizu region, Kagekatsu started to attack neighbor lords to expand his territory considering long battle between Ieyasu and Mitsunari, and did not make back attack to Ieyasu). 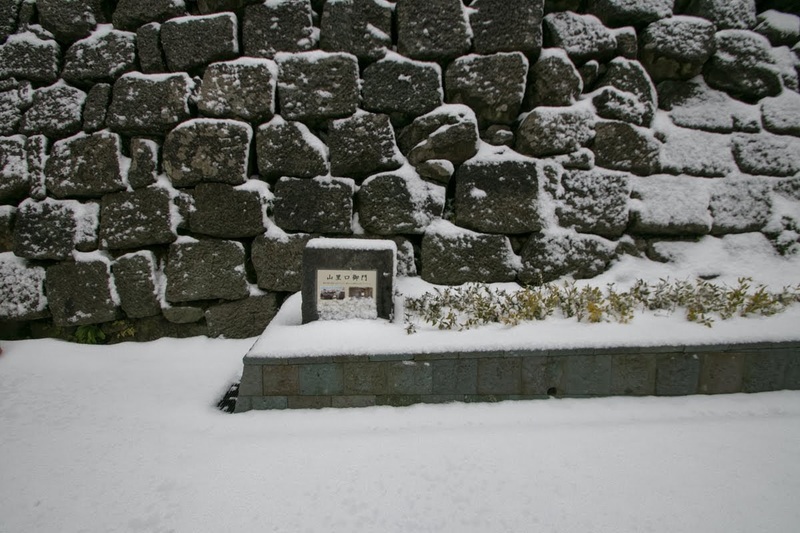 Finally Ieyasu won at the battle of Sekigahara against Ieyasu and seized his hegemony, and the existence of Hideyasu largely contributed to this. 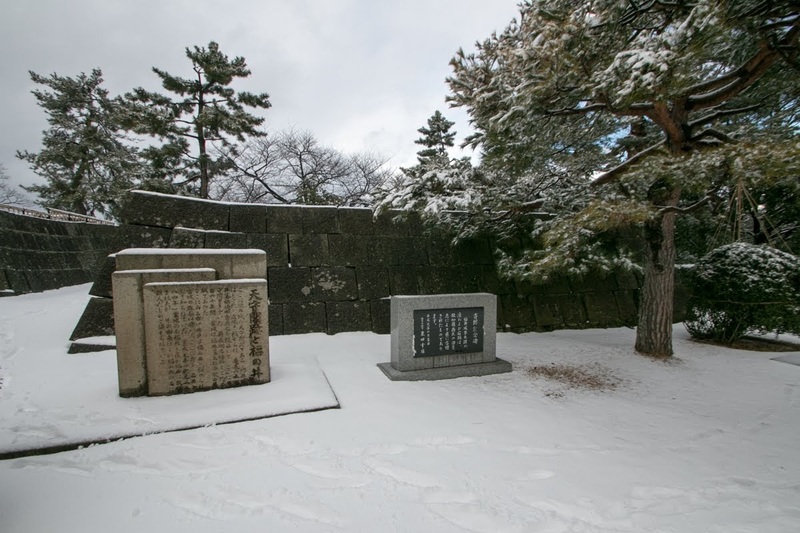 On the other hand, Hidetada lead second army made a fatal mistake against Masayuki Sanada (1547-1611) at Ueda castle and could not reach the battlefield by the battle. 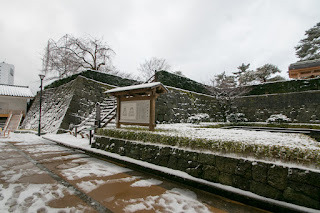 But under such situation, Ieyasu finally decided Hidetada as his successor and assigned him as a candidate of next Shogun in 1603. It is said that Ieyasu was afraid Hideyasu's strength as second Shogun, and preferred steadiness of Hidetada. 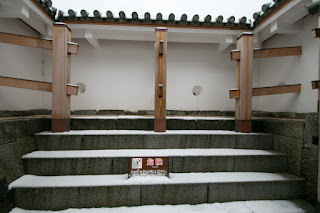 Anyway Hideyasu was once left Tokugawa clan, and it was difficult to become the next Shogun. 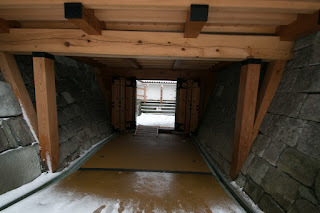 Even though could not become the second Shogun, but Tokugawa clan still need Hideyasu's existence. 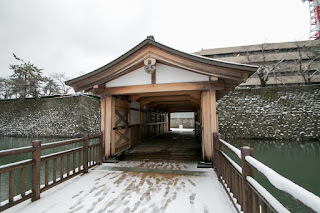 In Hokuriku region, Maeda clan, the second largest lord under Toyotomi government and had Kaga province and Noto province (Ishikawa prefecture), and Ecchu province (Toyama prefectre), still remain. 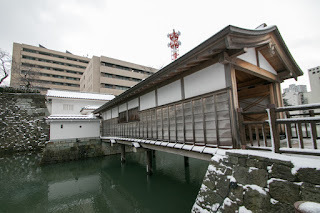 After the death of Toshiie Maeda (1538-1599), the founder of Maeda clan and friend of Hideyoshi, Maeda clan gave up its political role and subordinated to Ieyasu, and kept their territory. 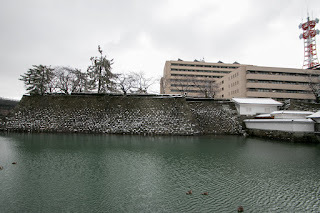 Maeda clan did not give any impression of non obedience to Tokugawa clan and Tokugawa clan could not confiscate their territory. 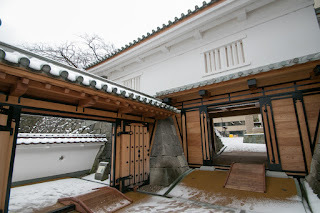 But Hideyoshi Toyotomi (1593-1615), son of Hideyoshi, still alive at Osaka castle, and Tokugawa clan had to watch and divide the cooperation of both clan against Edo Shogunate. 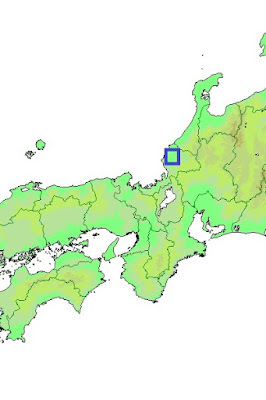 As above, in 1600, just after the battle of Sekigahara, Hideyasu was appointed as a governor of Echizen country. 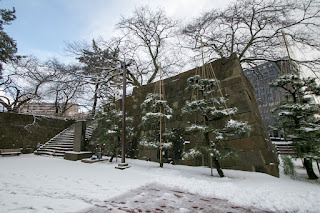 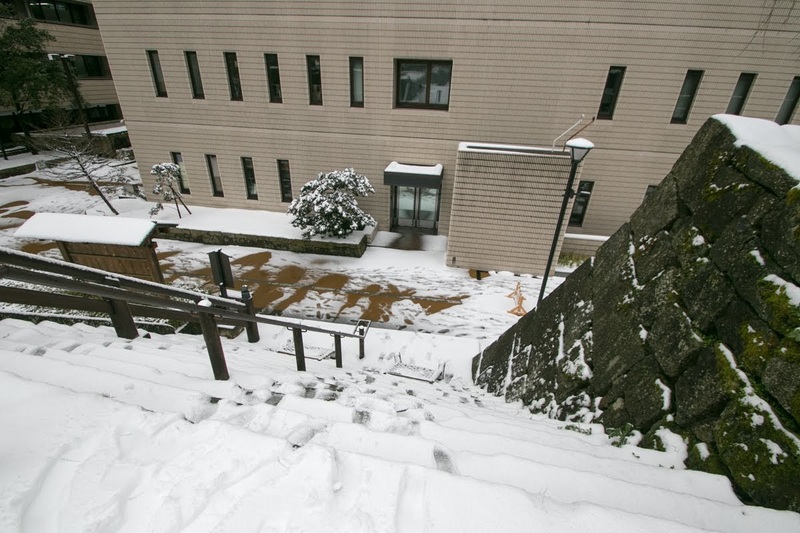 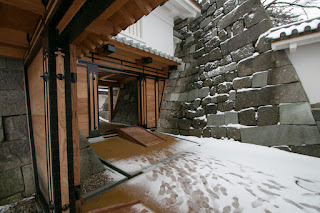 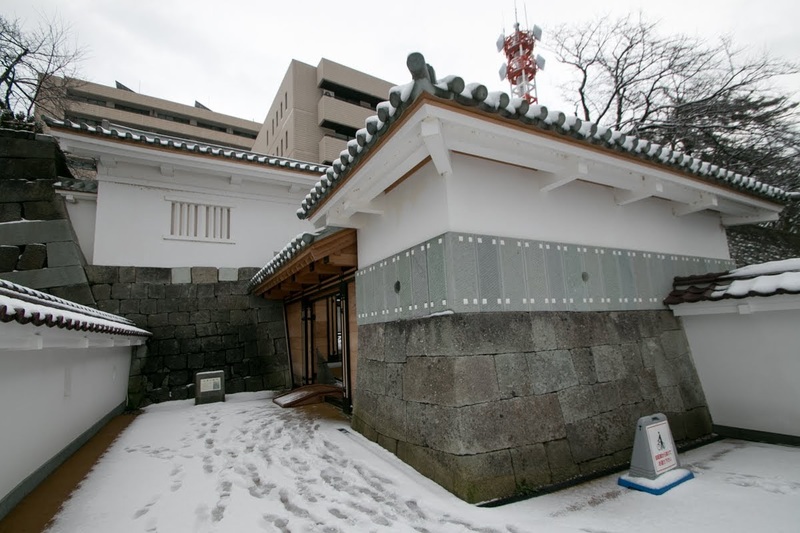 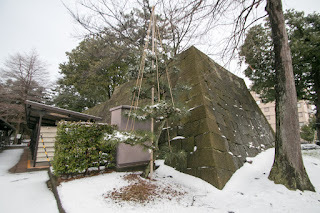 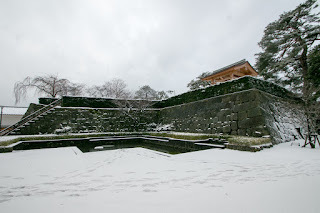 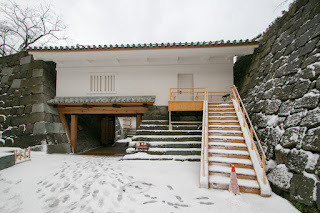 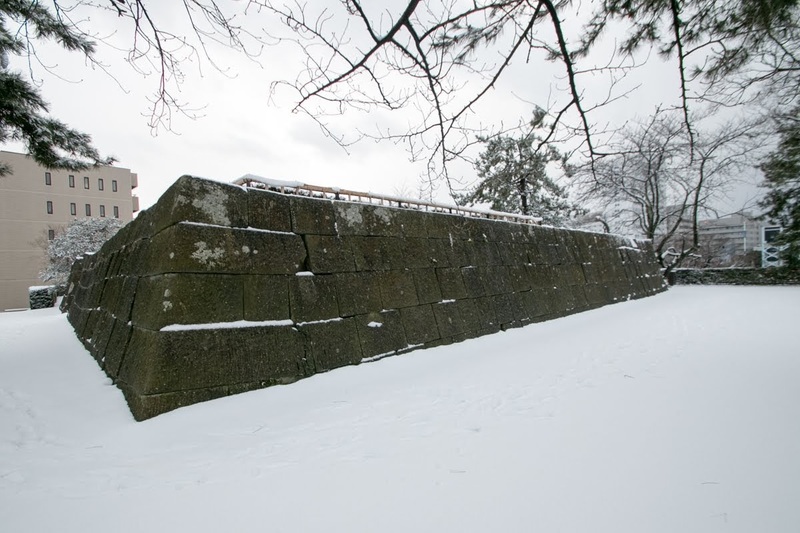 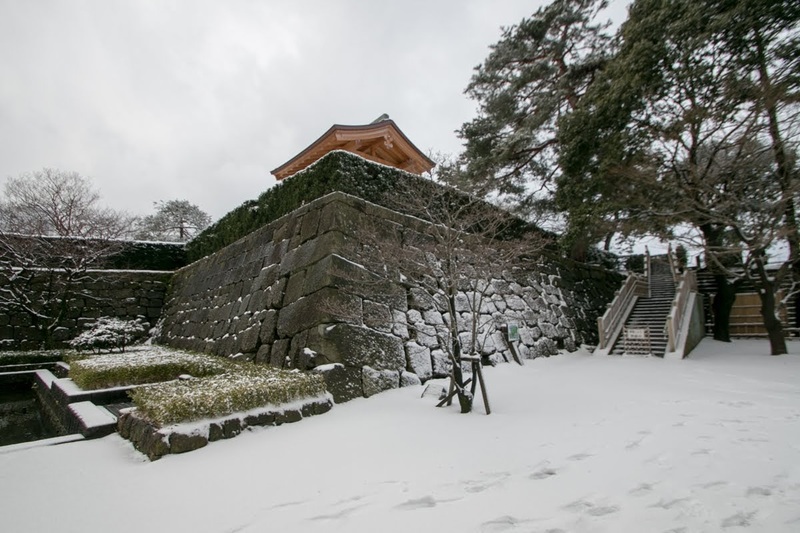 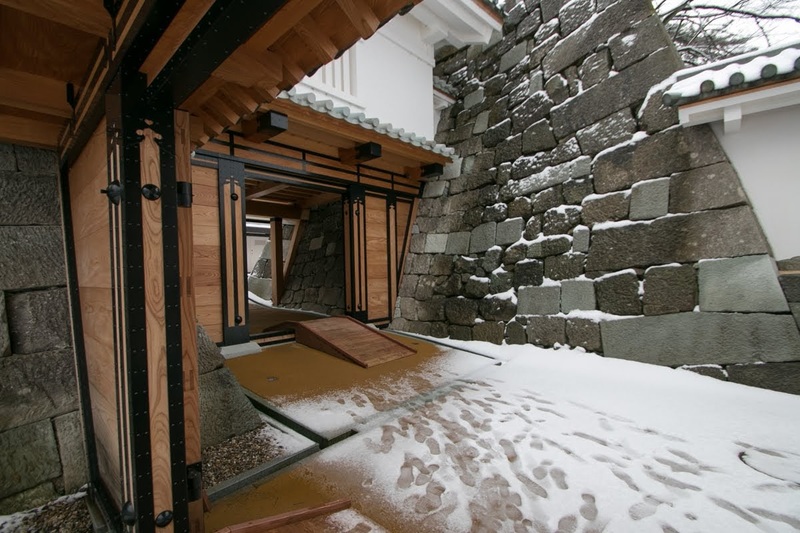 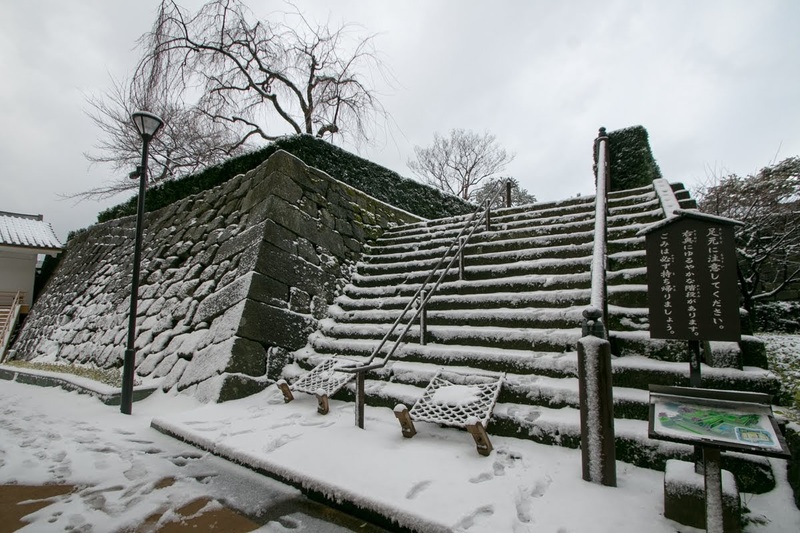 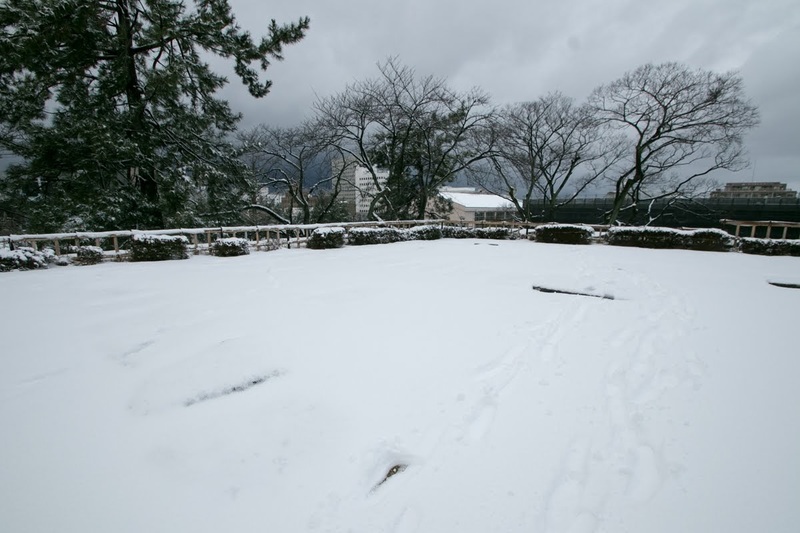 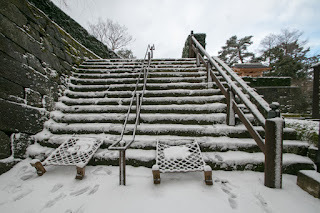 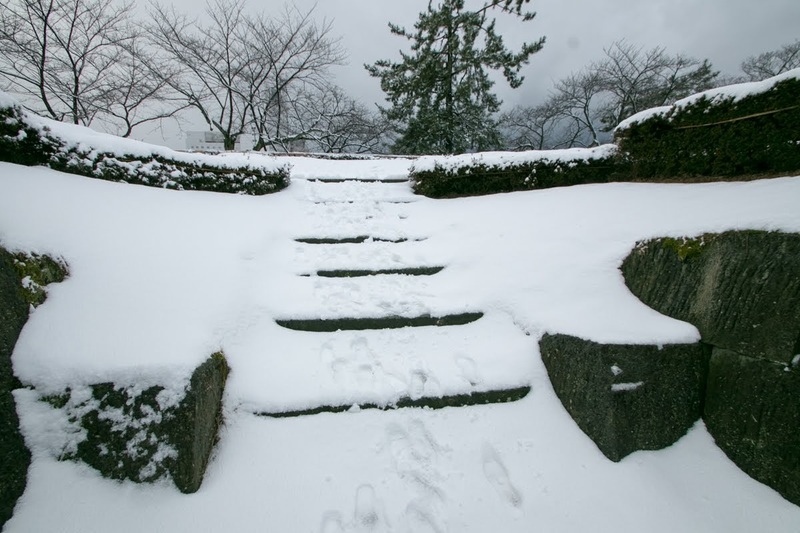 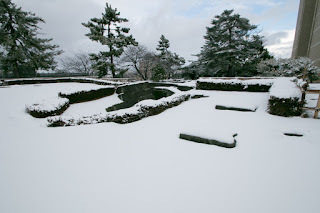 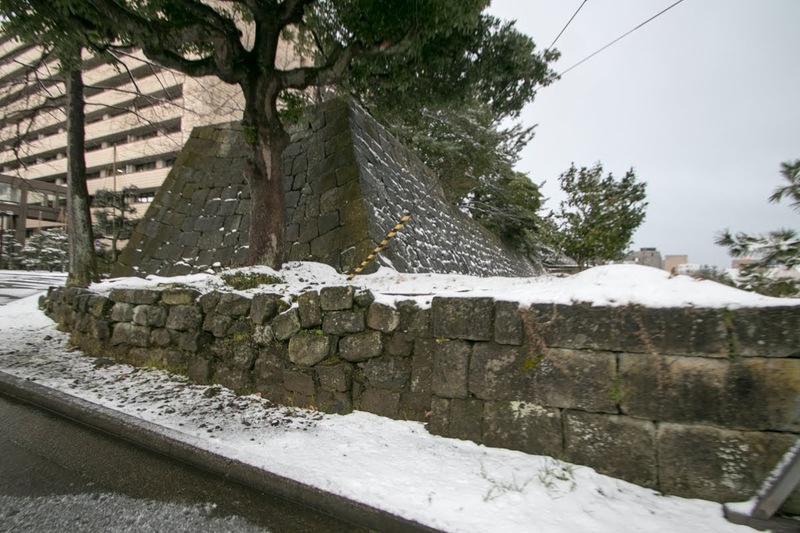 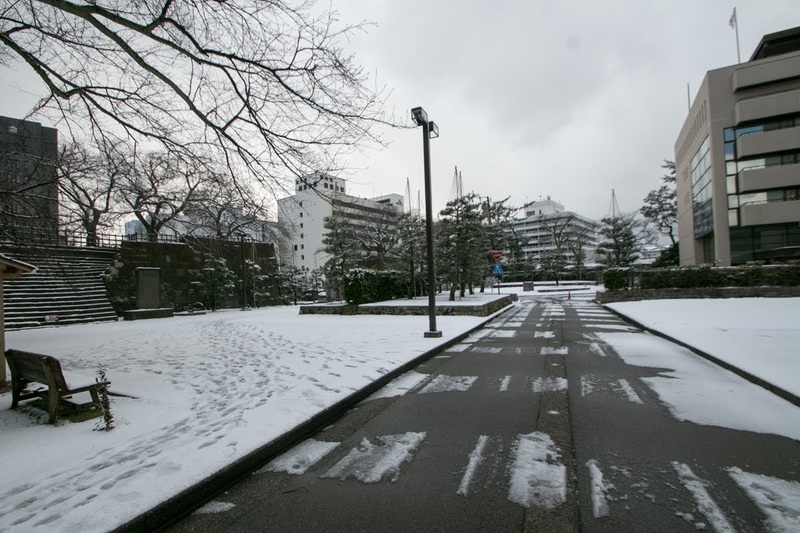 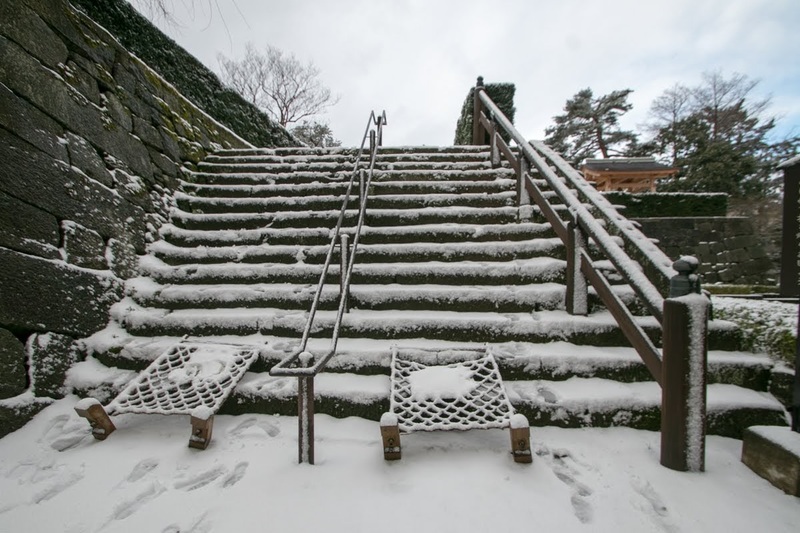 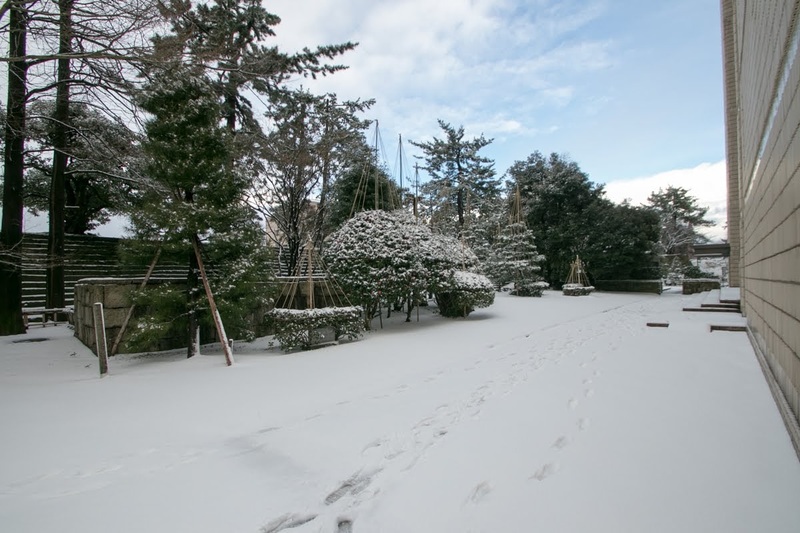 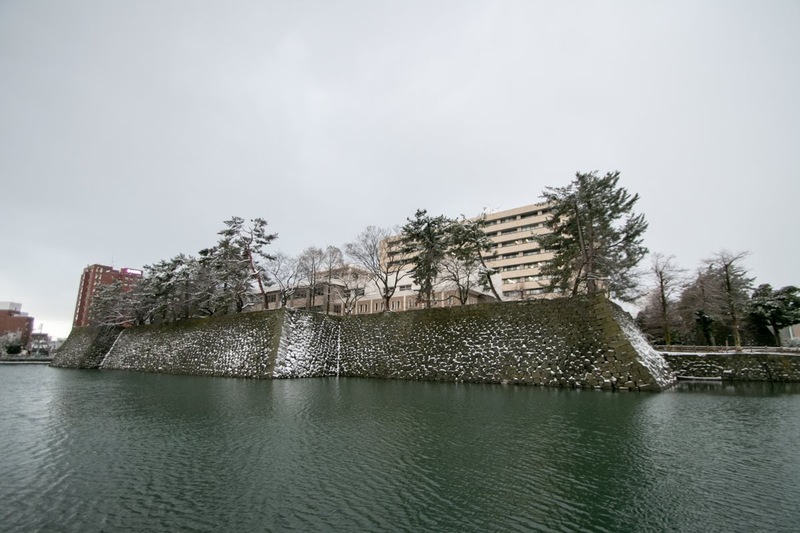 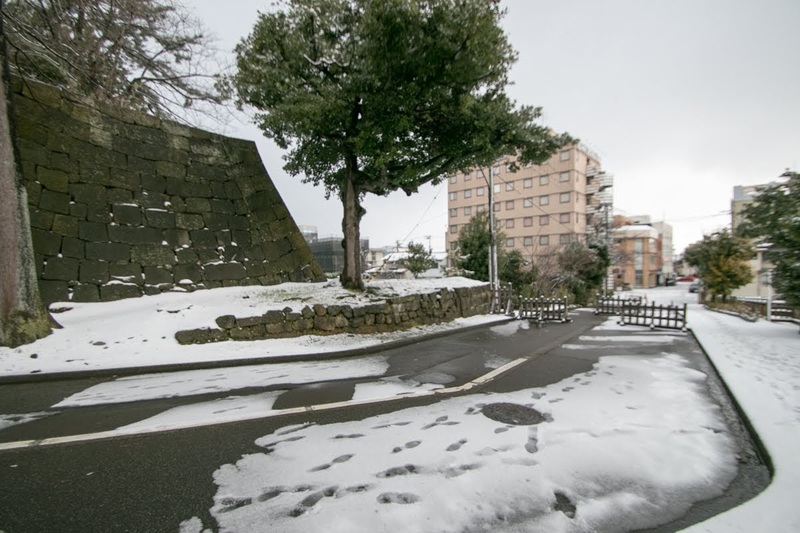 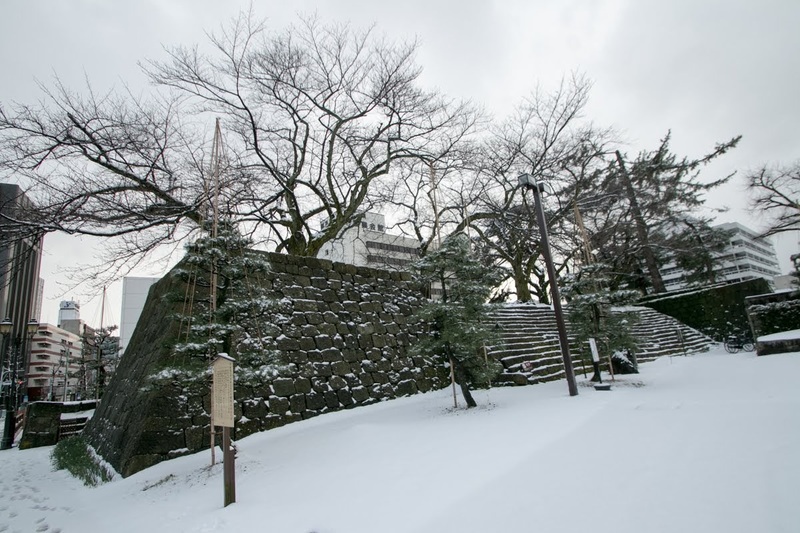 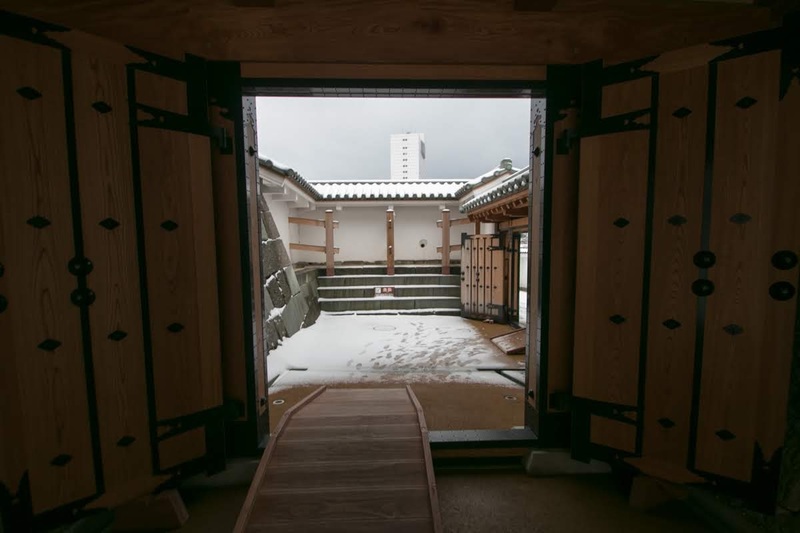 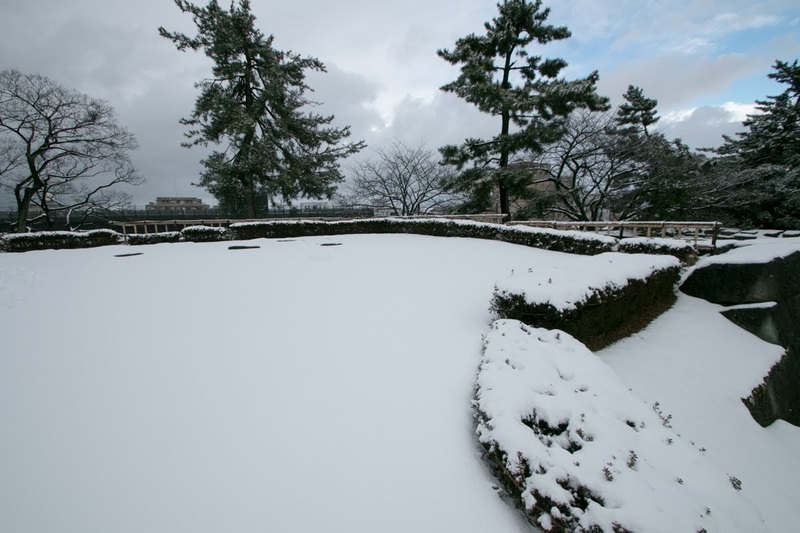 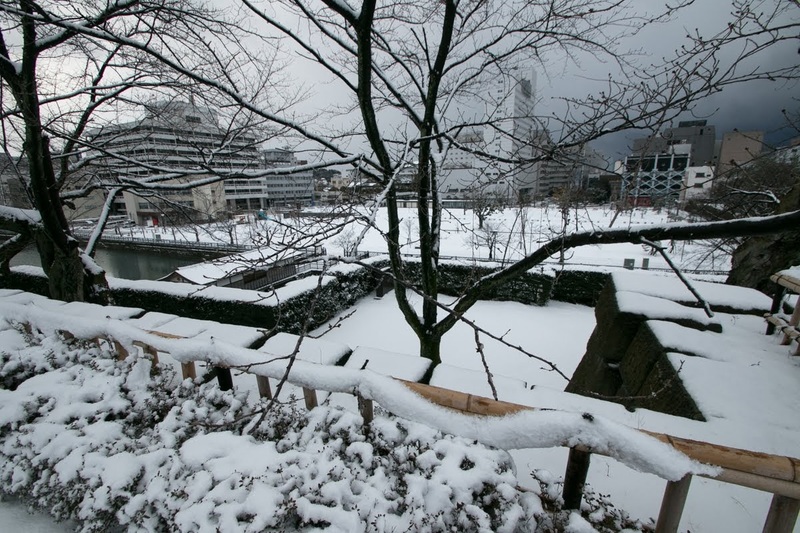 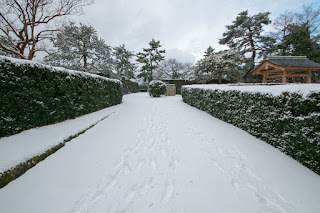 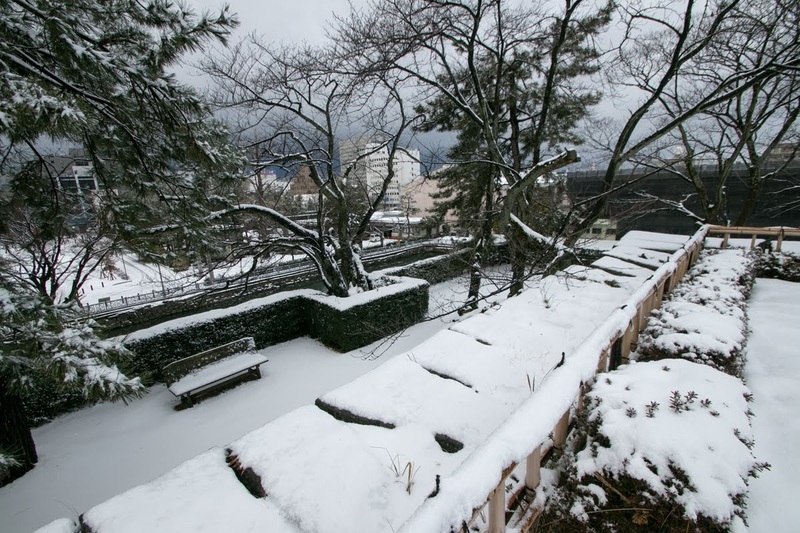 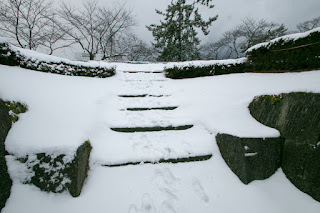 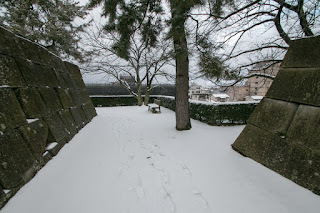 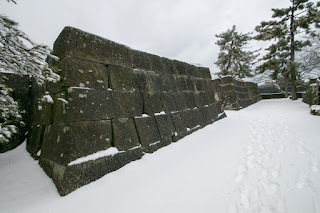 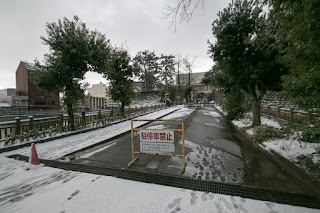 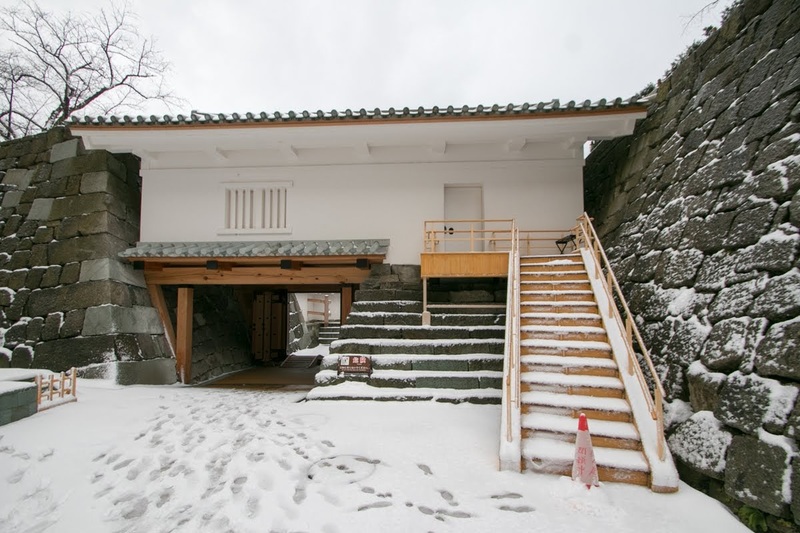 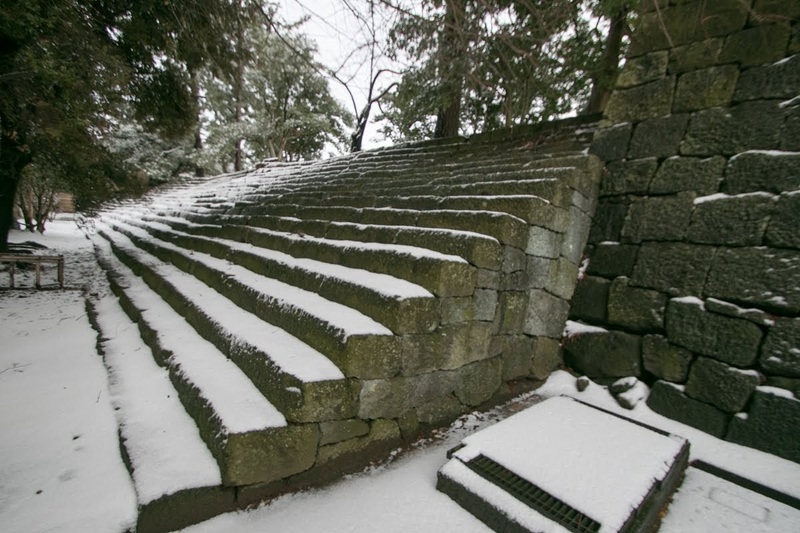 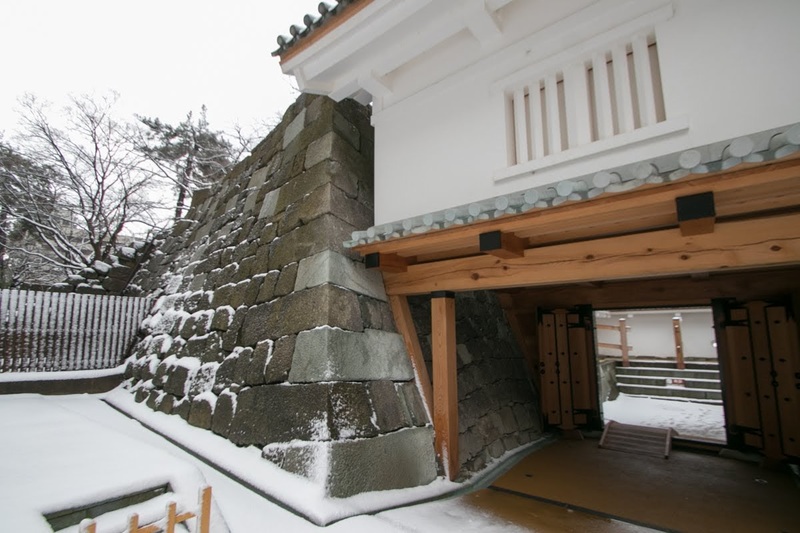 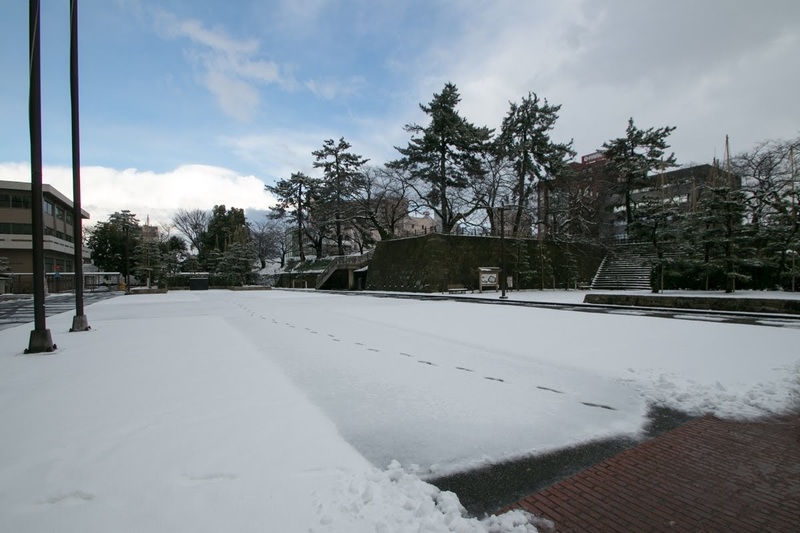 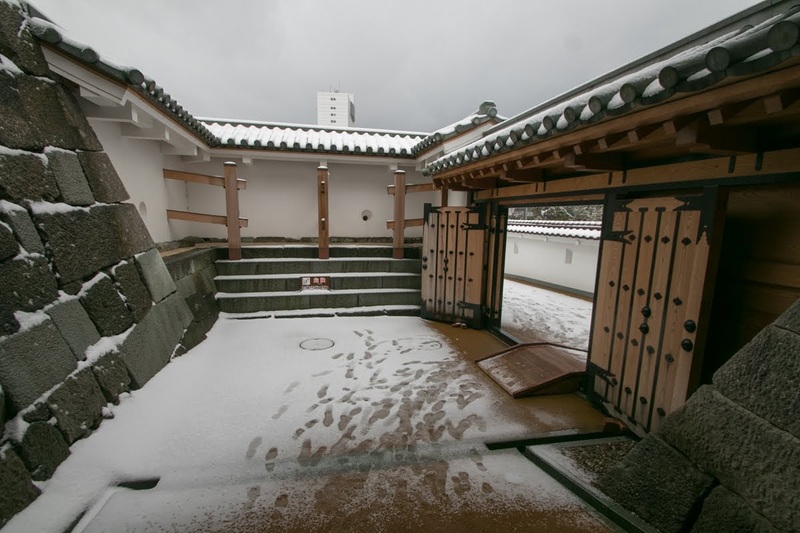 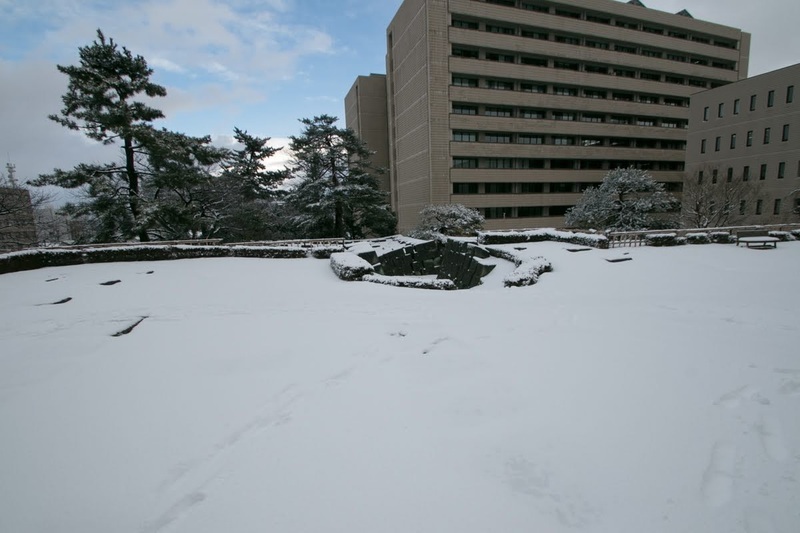 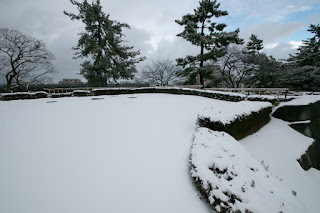 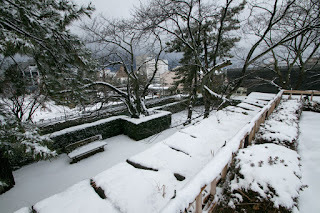 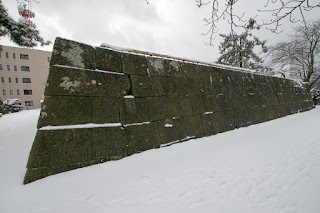 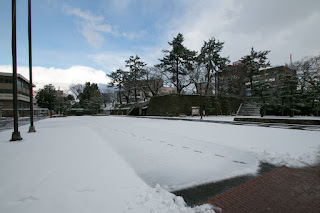 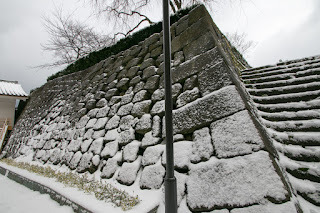 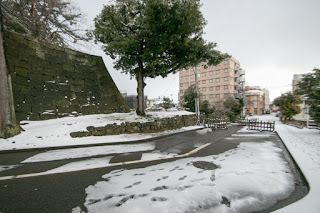 Next year Hideyasu started to expand current Kitanosho castle into a modern and secure castle. 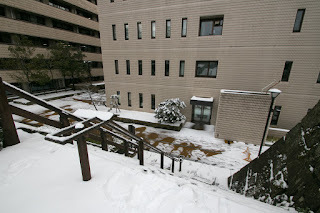 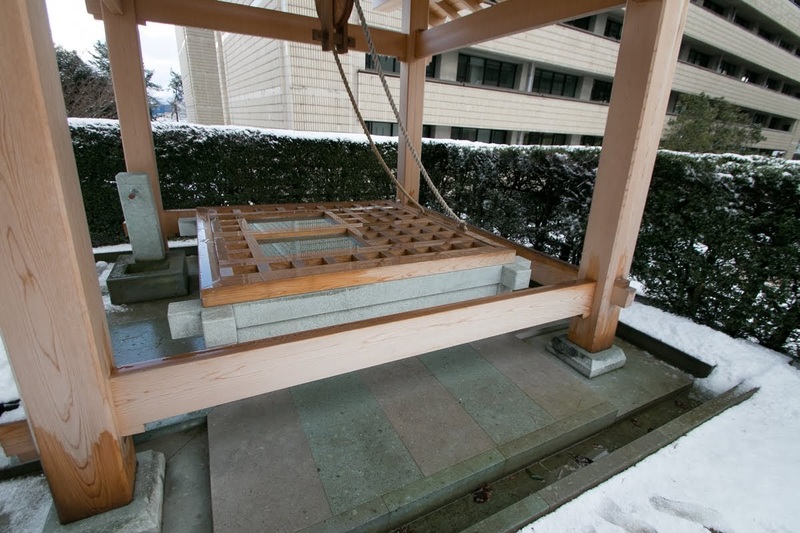 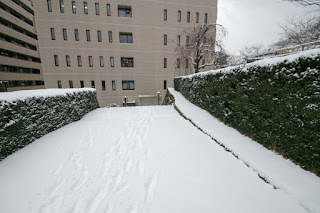 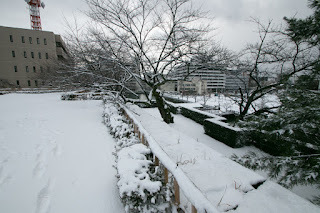 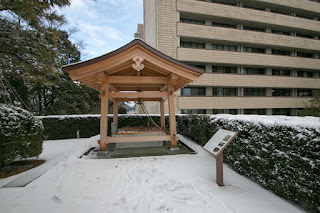 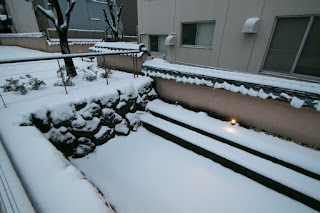 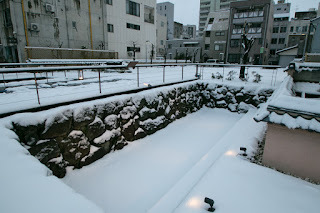 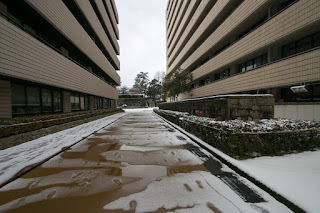 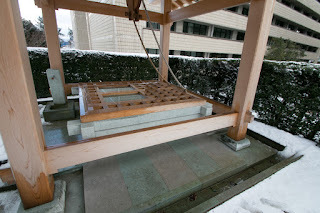 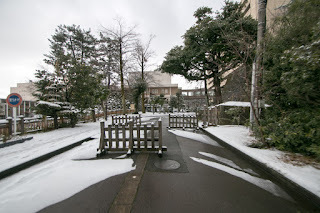 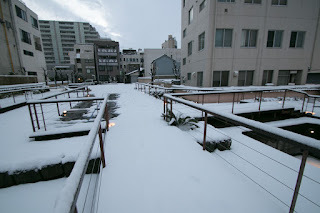 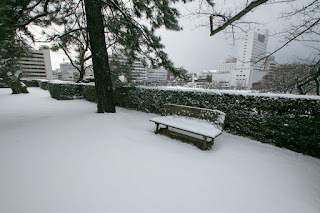 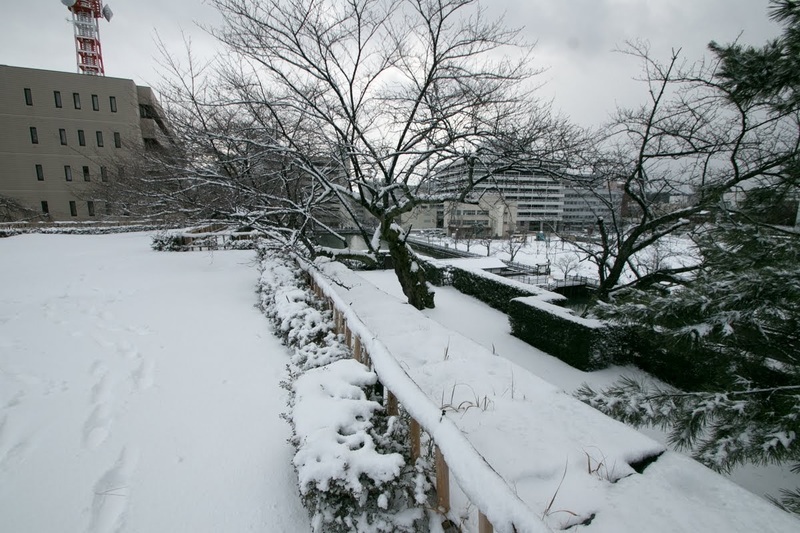 As a residence of relative of Tokugawa clan, many new coming lord were told to participate in the building. 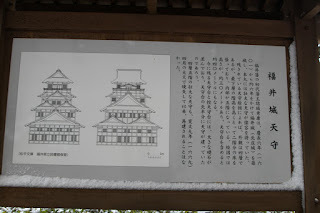 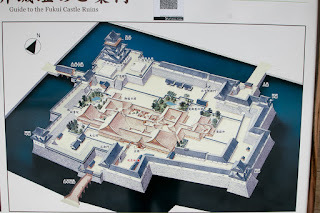 After six years construction, new castle was built and named Fukui castle. 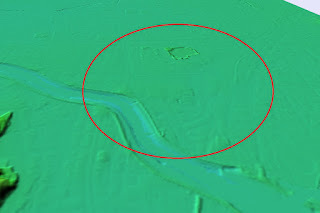 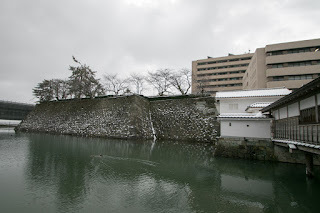 The central area of the castle moved from river side to inland, probably to prevent direct shot of cannon from the opposite of the river. The shape of central area is generally a square of 100 meter length, but each side has a winding line to erase the dead angle. 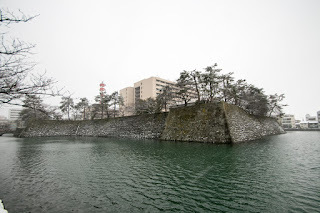 At the northwestern edge of central area there was a huge basement of main tower with 60 meter length, about one third length of central area. 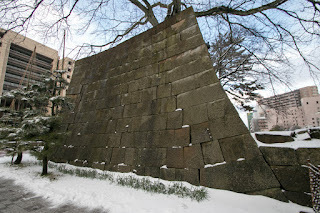 On the basement a huge five story main tower was built, but it was lost by fire in 1669 and never built again. 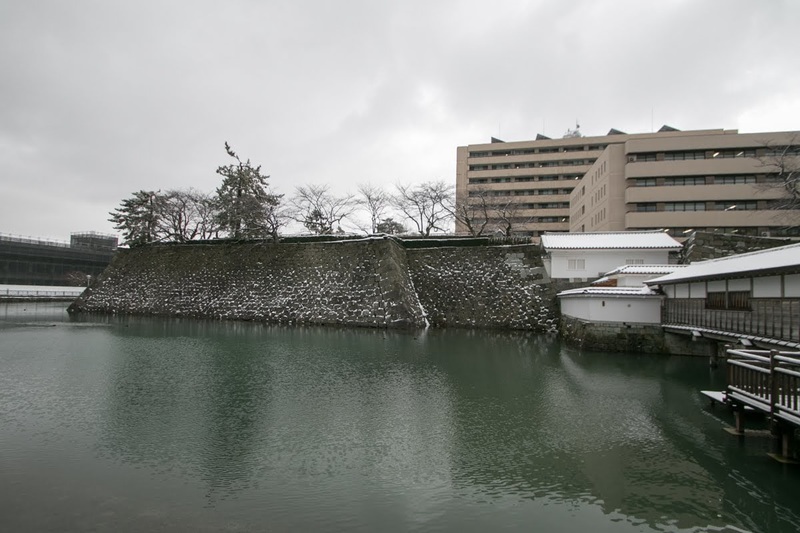 Outer area spread at whole area of current central city, and also guarded by stone walls and water moats. 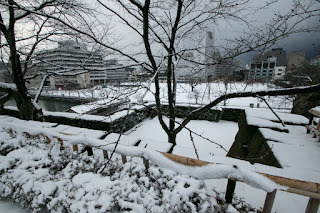 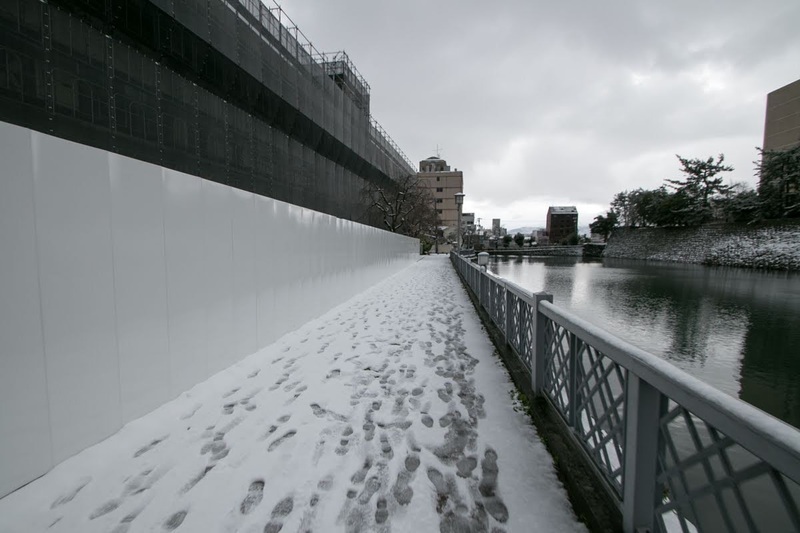 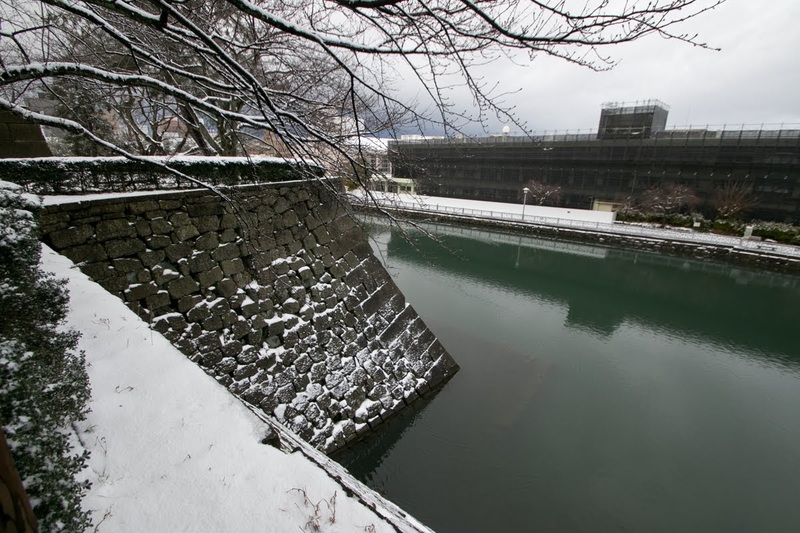 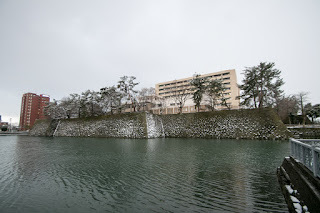 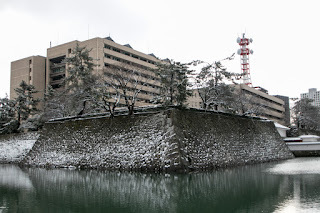 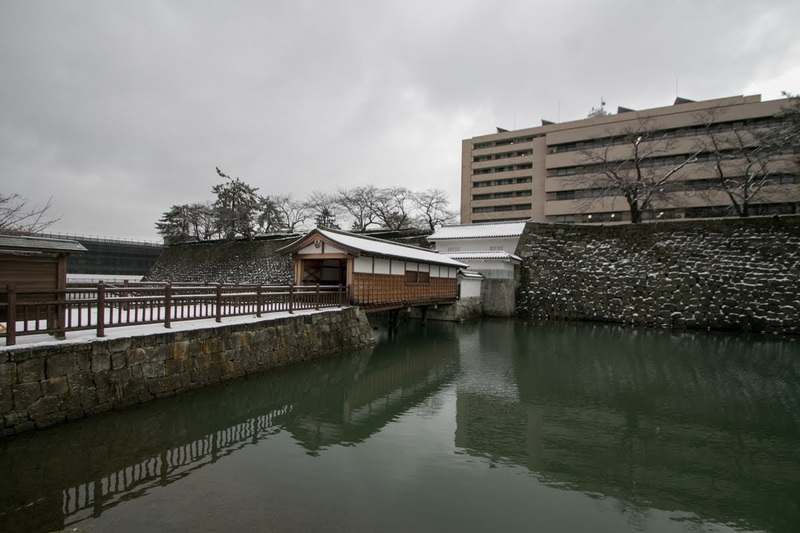 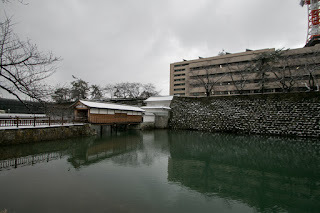 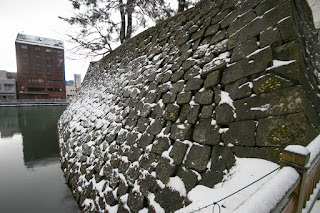 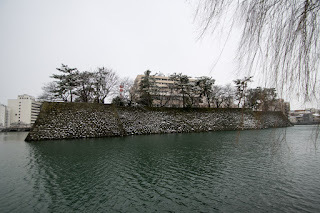 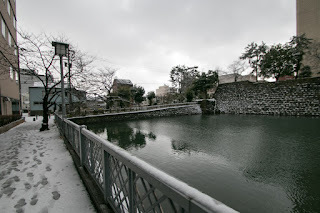 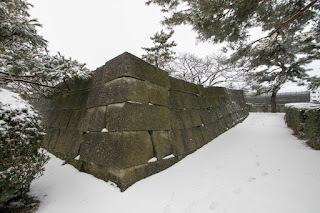 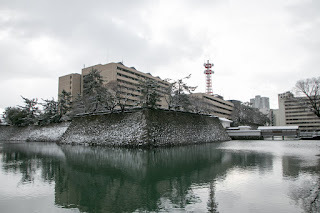 External barrier surrounded castle town at the north and west side which were not faced rivers, and total size of the castle reached 1000 meter long and 500 meter width. 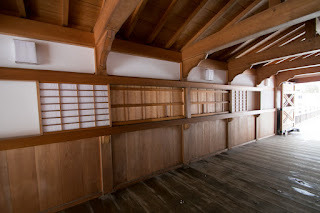 Unfortunately Hideyasu died in youth, but even though having many troubles his house continued as a large feudal domain at Hokuriku region throughout Edo era. 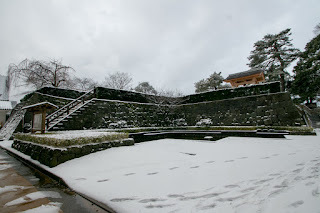 As a house of Shogun's brother his house was thought important by Shogunate, and his descendants became the governor of Tsuyama Castle (Okayama prefecture) or Matsue castle (Shimane prefecture) other than this castle. 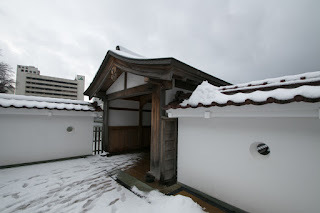 At the end of Edo era, Yoshinaga Matsudaira (1828-1890), the leader of the clan at the time, went ahead modernization of the domain and lead the politics of the time along with Hisamitsu Shimazu (1817-1887), Munenari Date (1818-1892) and Yodo Yamauchi (1827-1872). 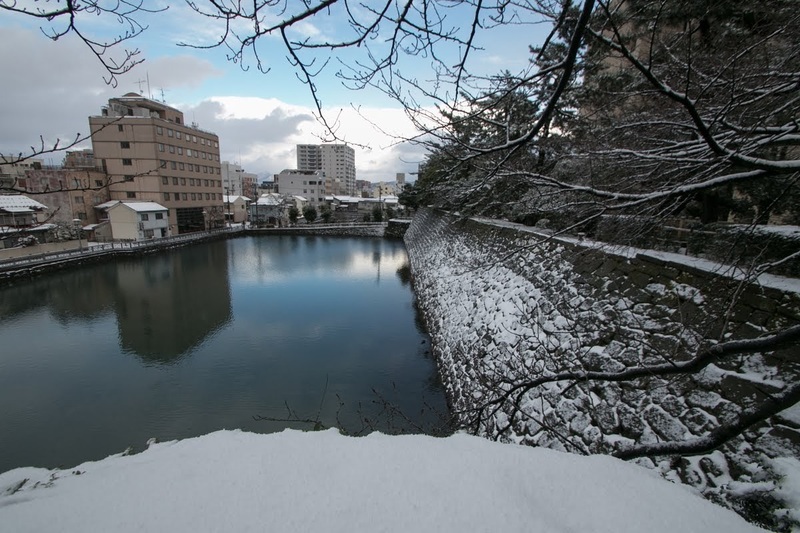 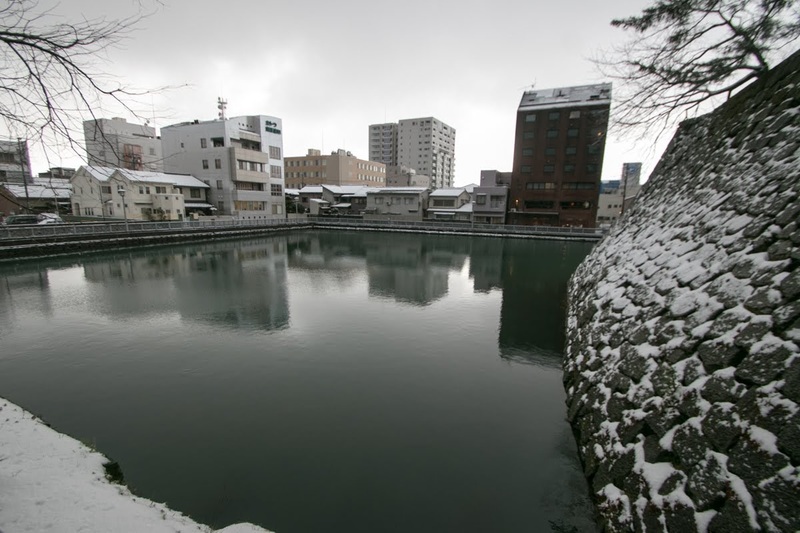 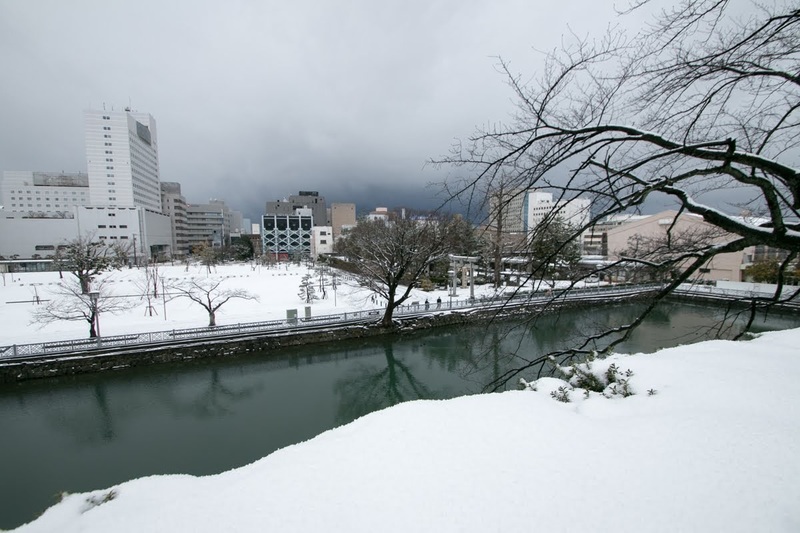 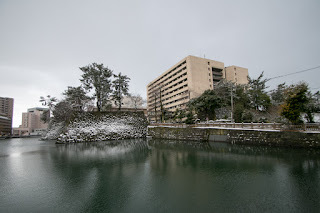 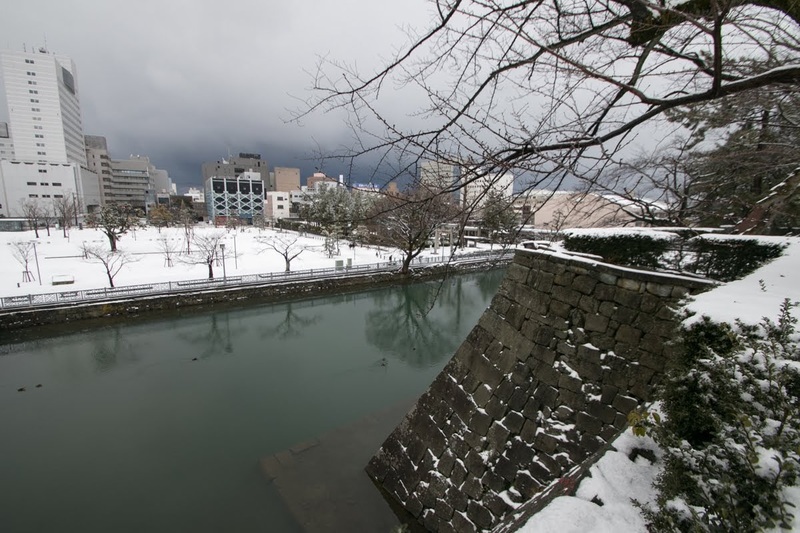 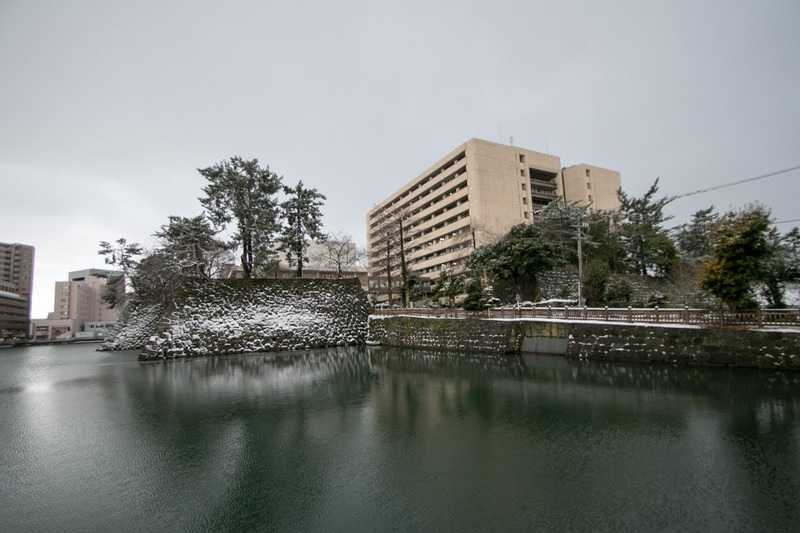 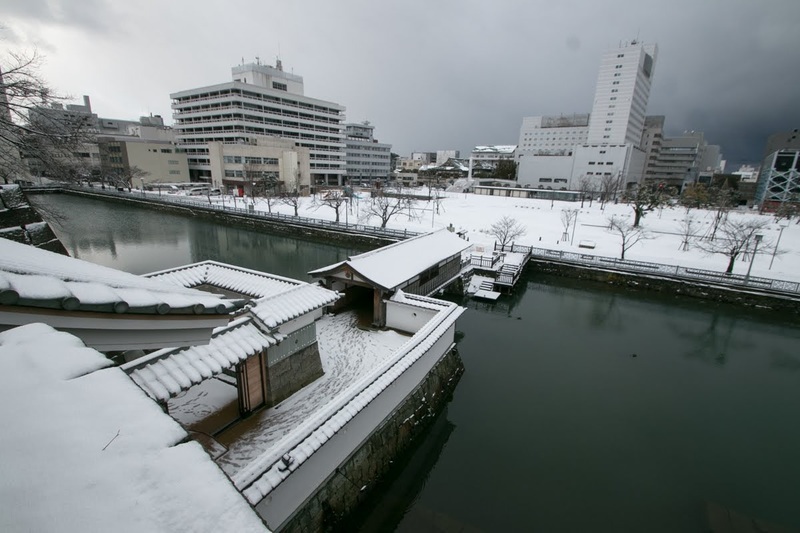 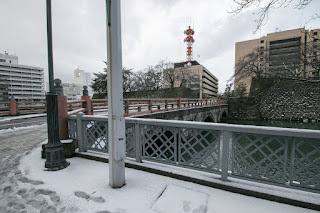 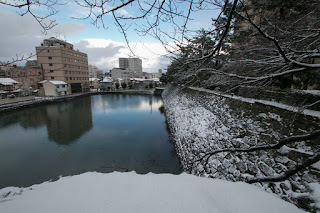 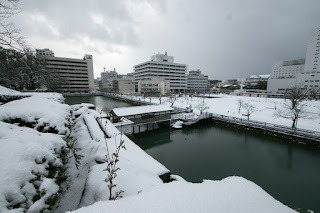 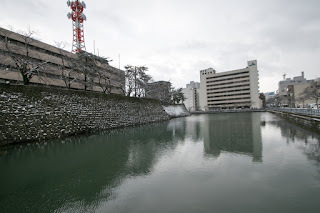 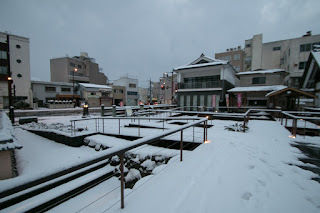 Subsequent to Meiji revolution, Yoshinogawa river was reclaimed as a site of railway, and outer areas and all buildings were totally destructed and transformed into governmental area. 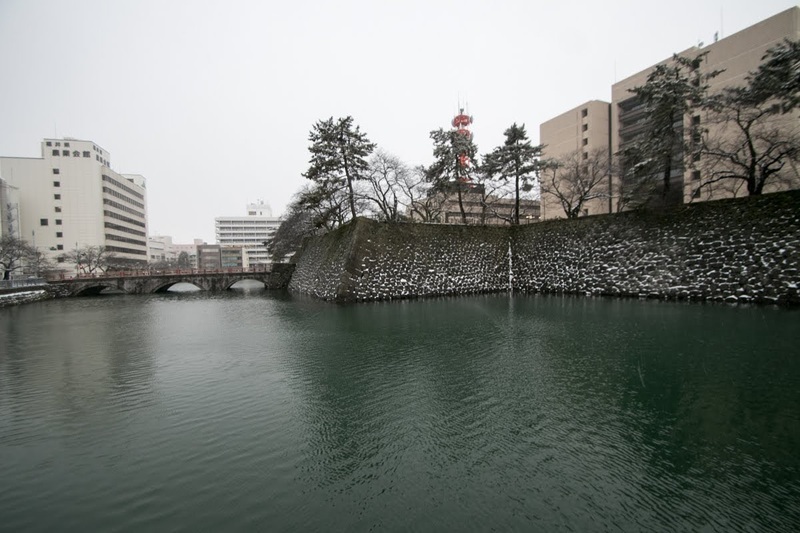 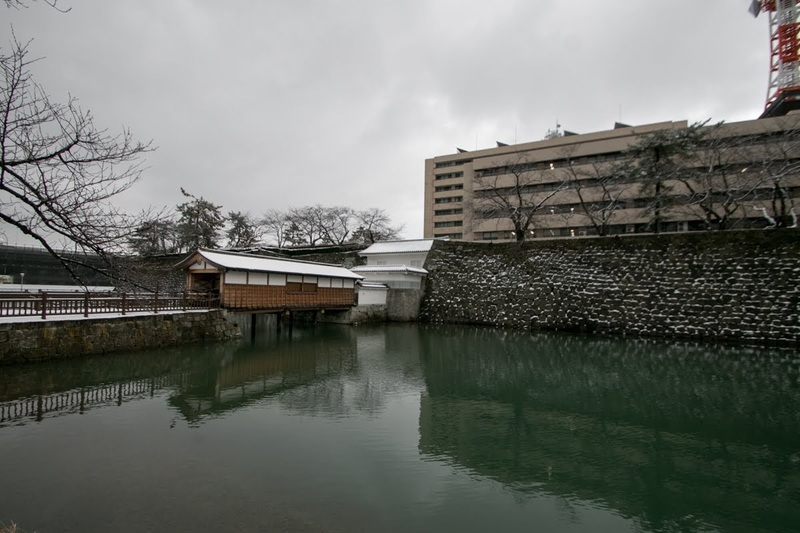 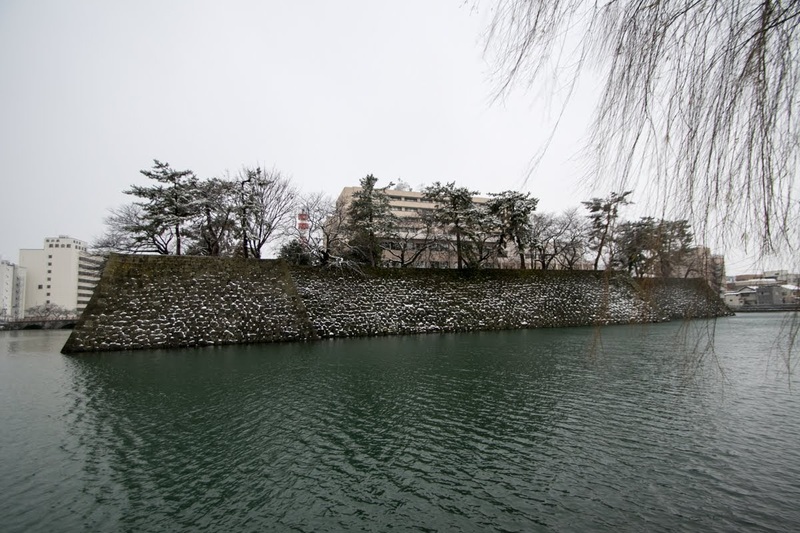 But central area was continuously used as a local government office, and stone walls and inner water moats remain until now. 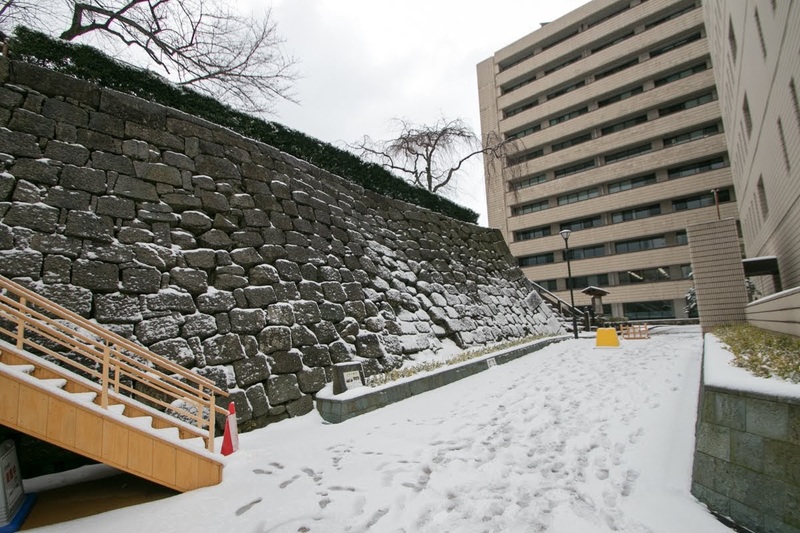 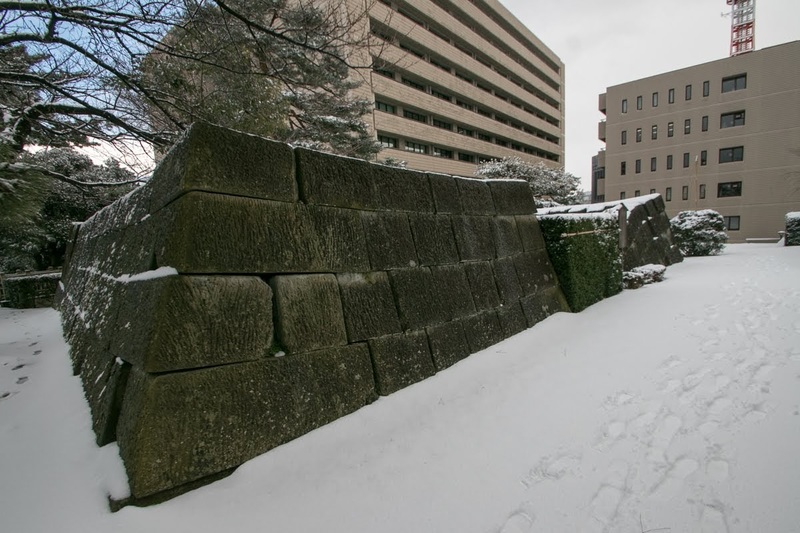 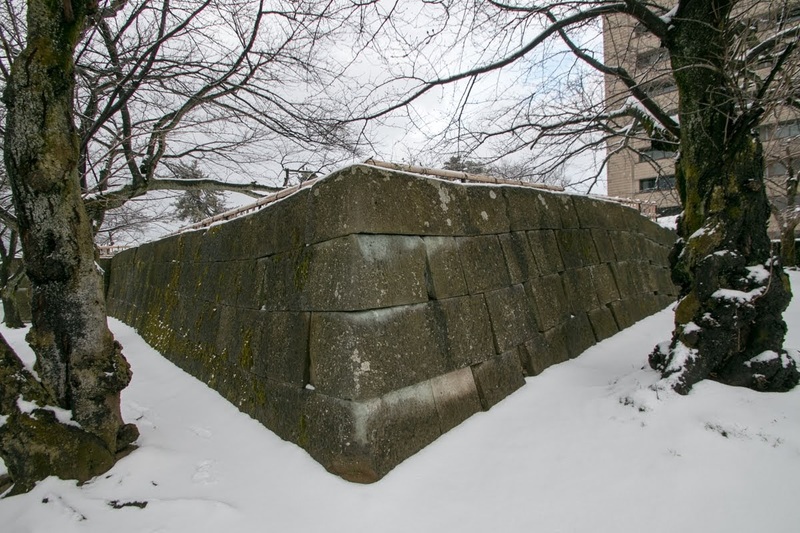 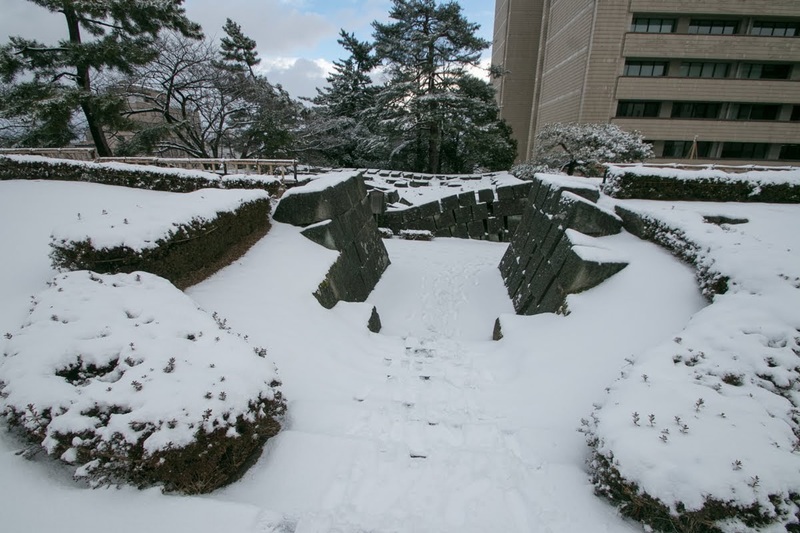 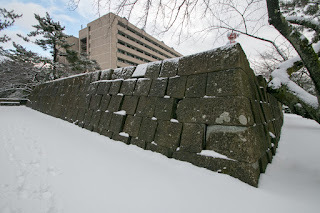 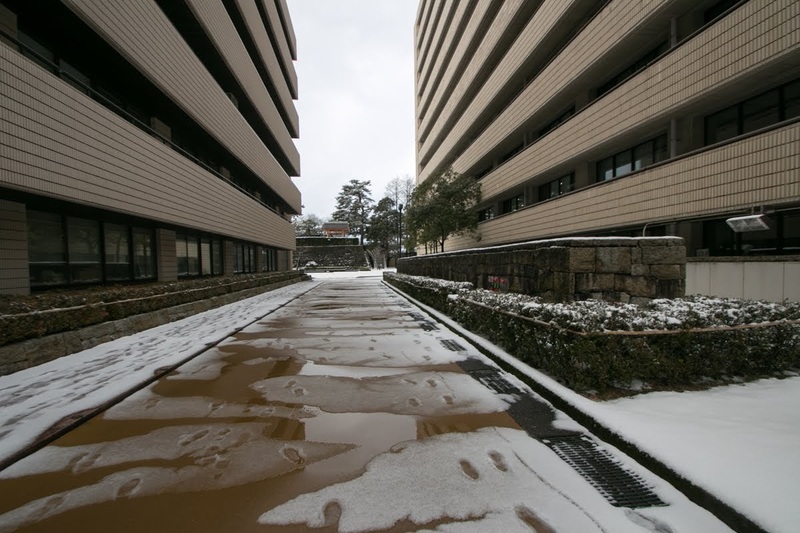 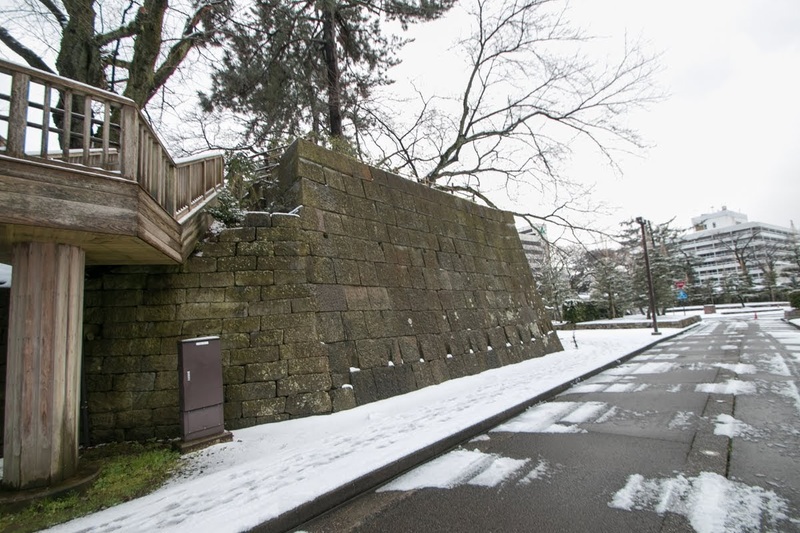 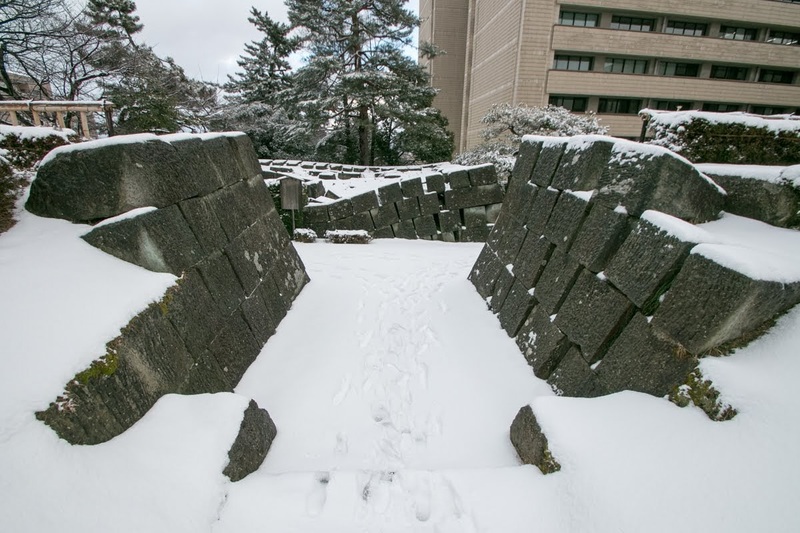 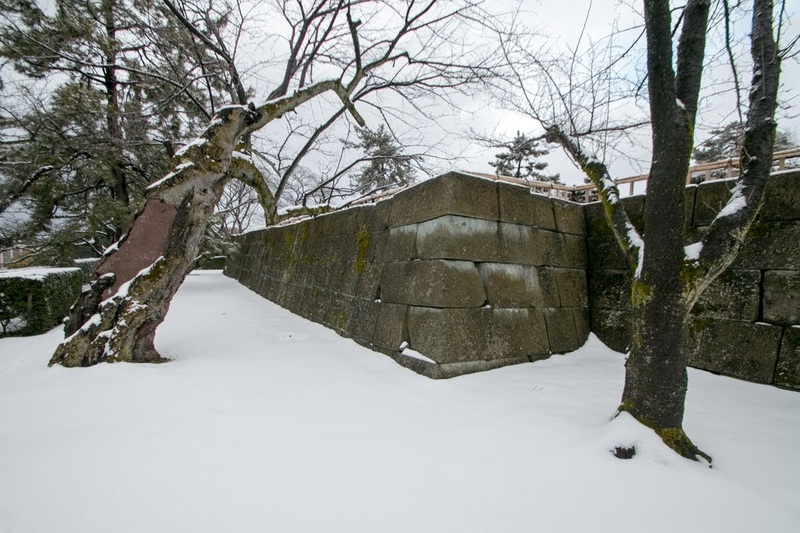 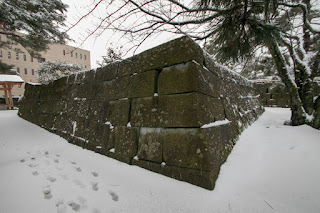 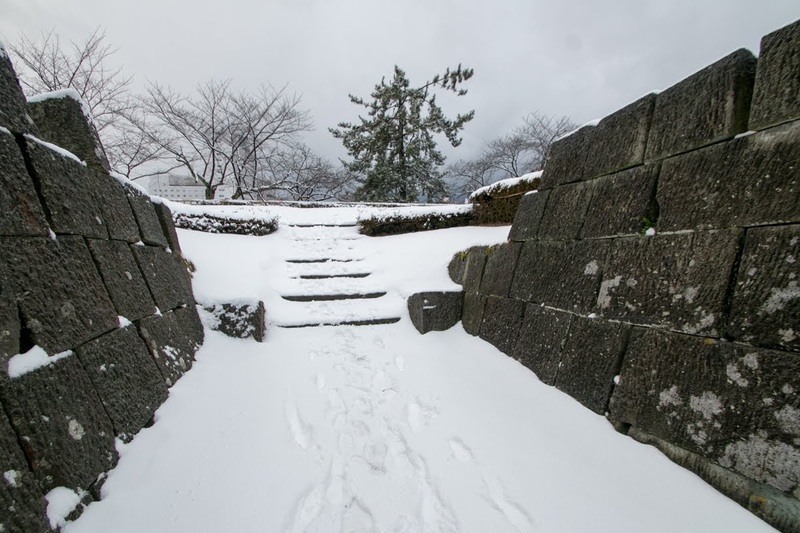 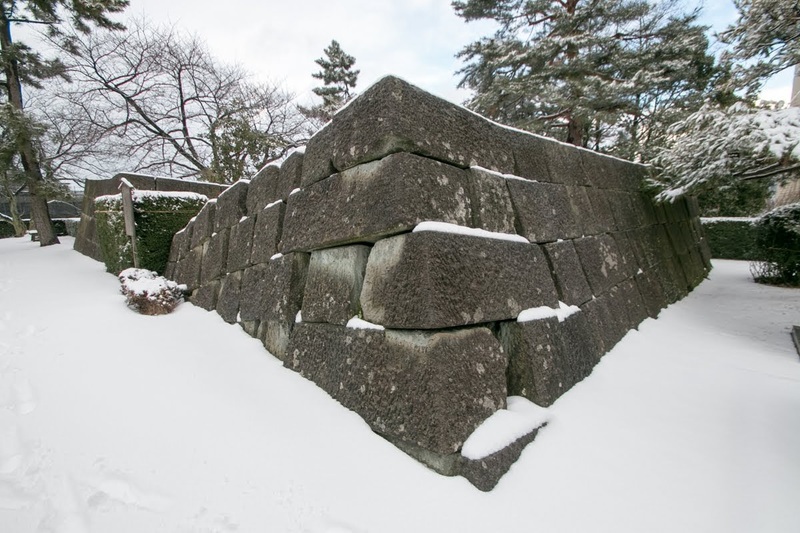 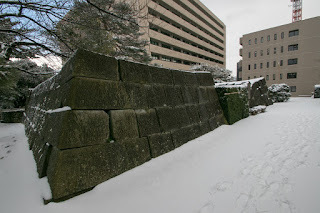 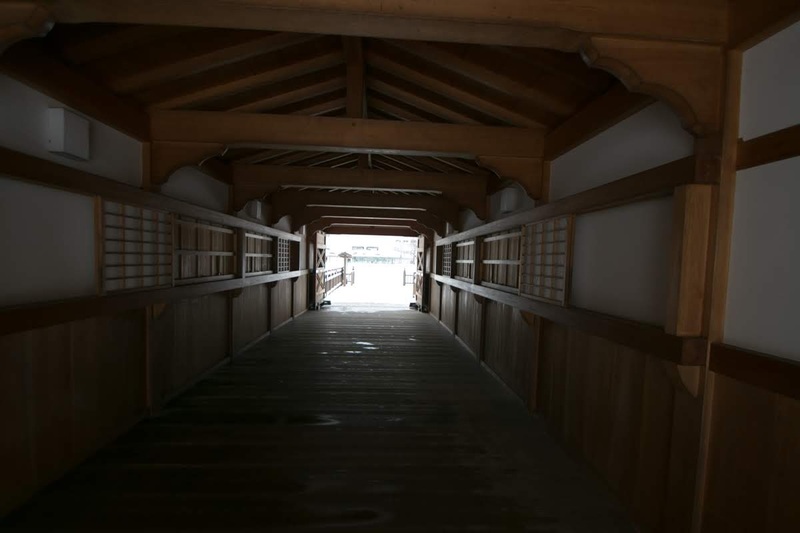 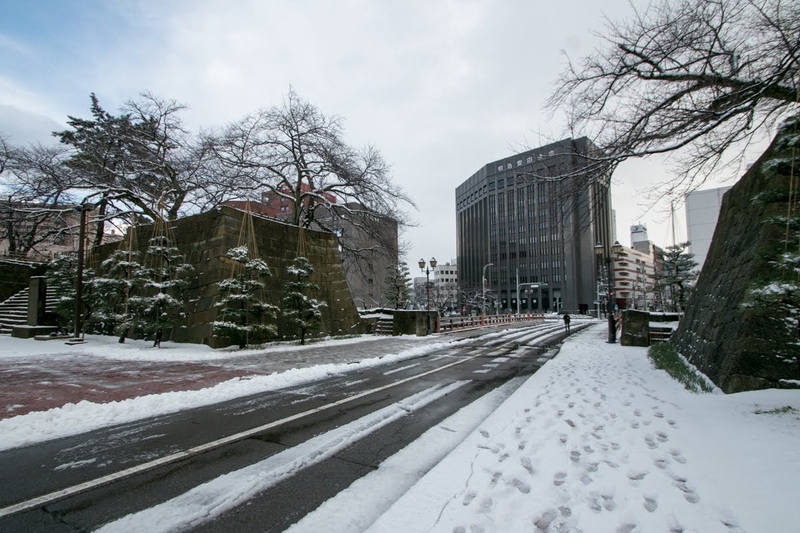 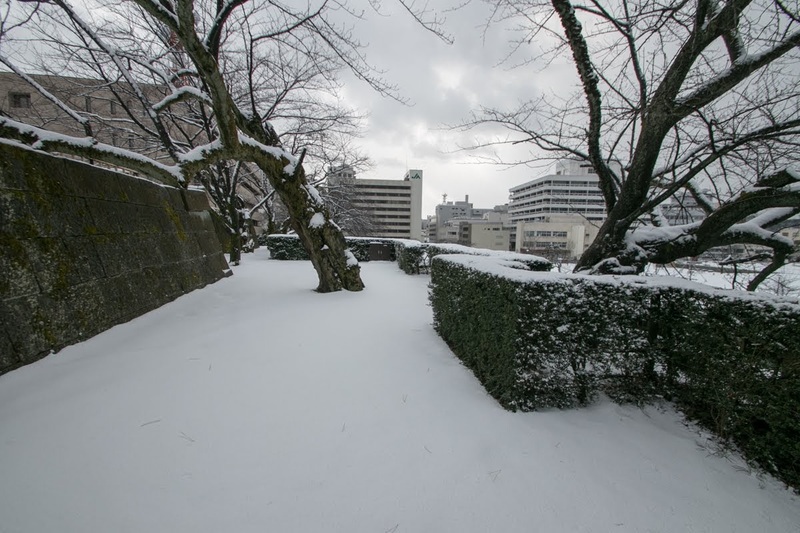 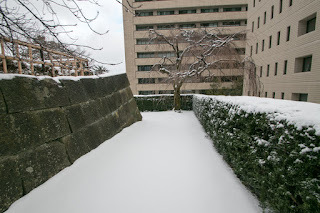 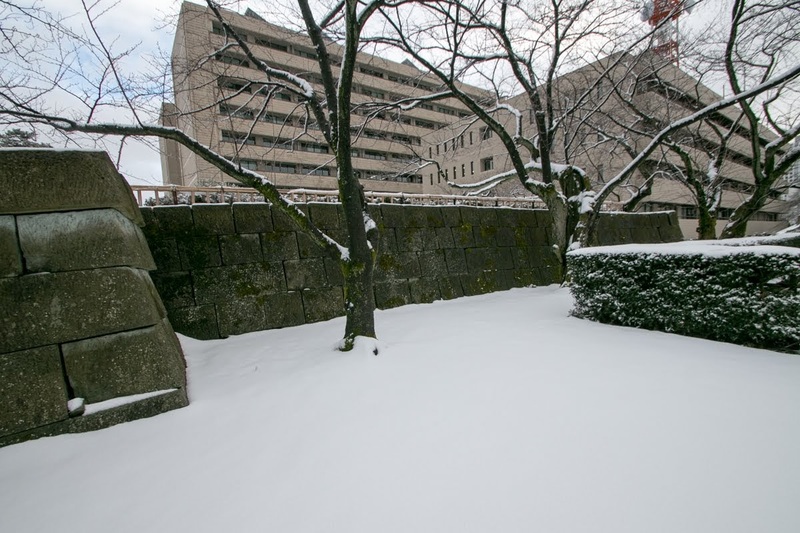 A corridor bridge into central area was reconstructed, and magnificent stone walls of the central area impress us authority of brave son of Ieyasu. 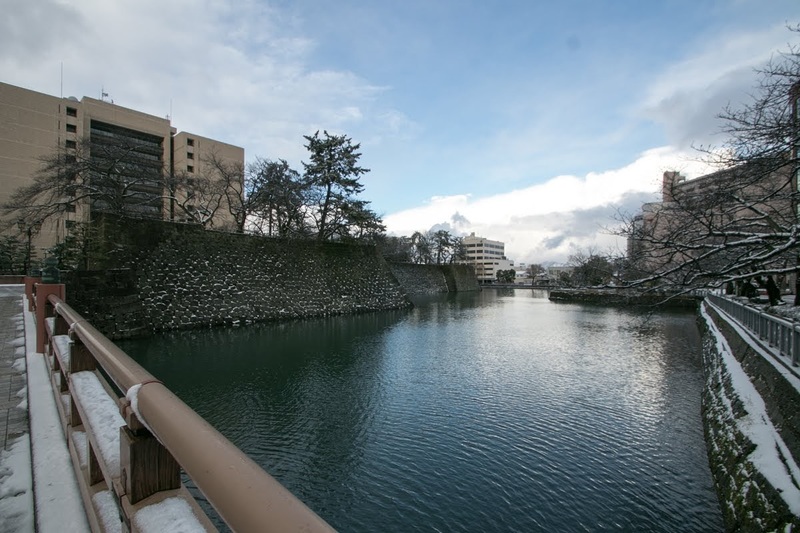 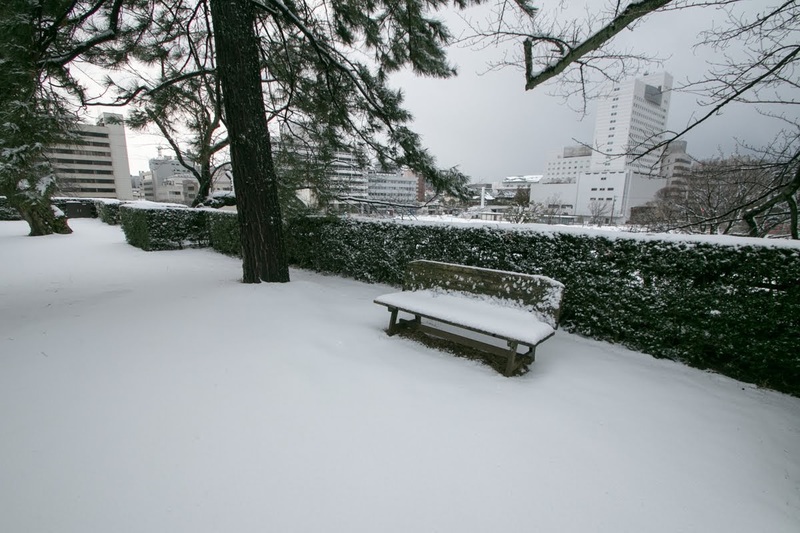 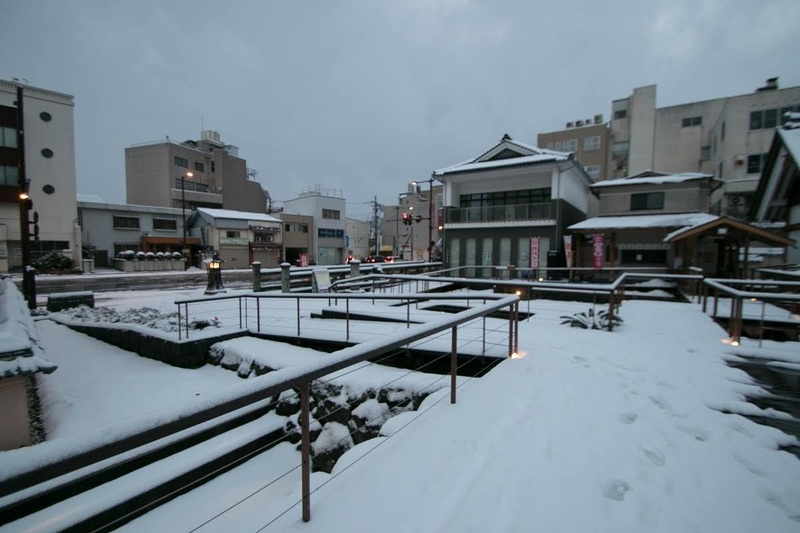 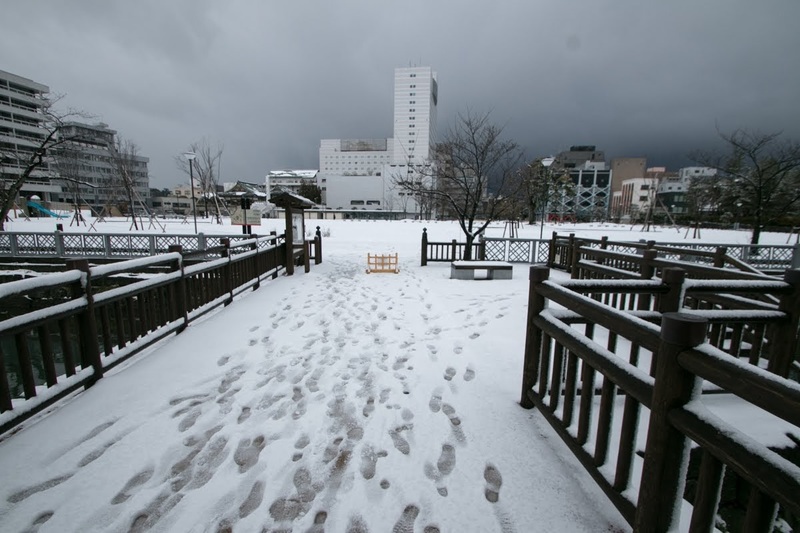 15 minutes walk from JR West Hokuriku-Honsen line Fukui station. 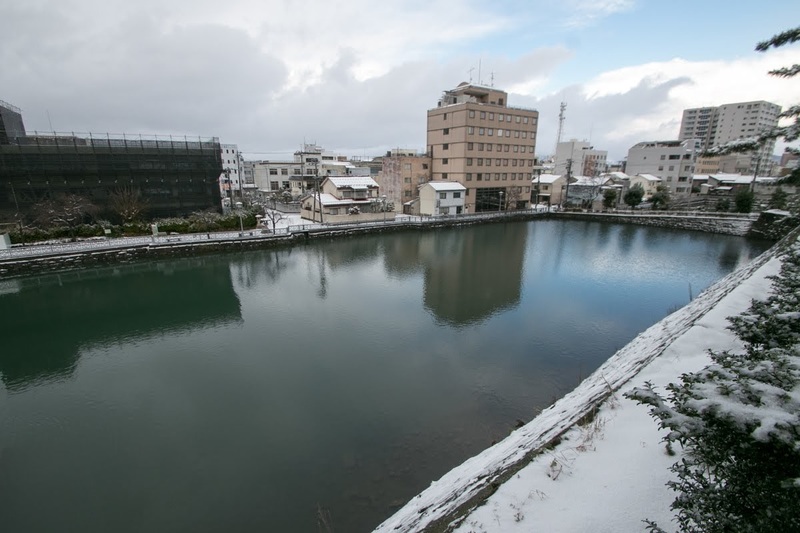 20 minutes drive from Hokuriku Jidoshado Expressway Fukui interchange.